Labor Day Weekend, the unofficial start of the holiday season. Just kidding. Mostly. It does have a shifting feel to it though, everything starting back up again. It’s going to be a sewing weekend for me. 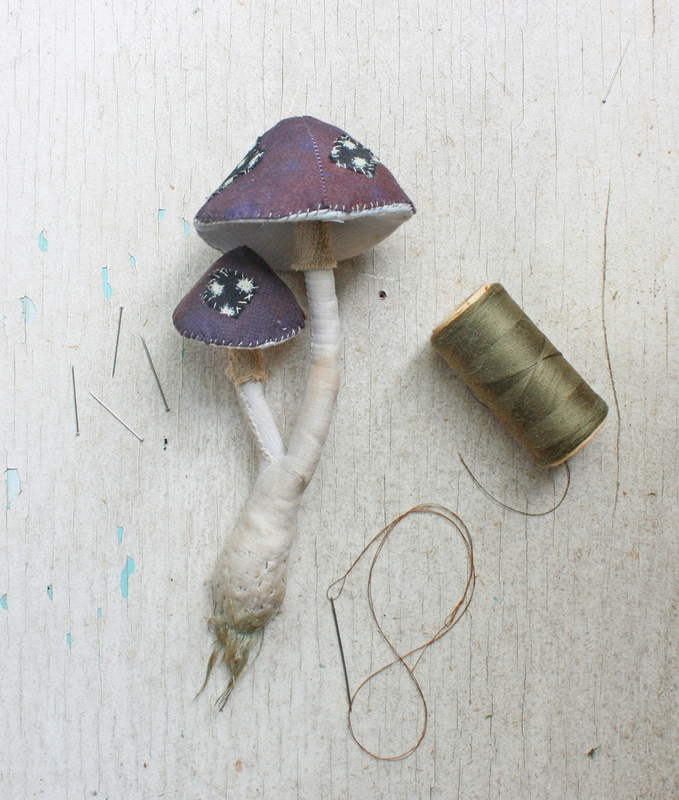 Fun sewing, amulets and mushrooms and Monday devoted entirely to experimenting. I’ll give you the full report on that next week. I’m still having a good time making amulets, small thoughts, and they are generating all sorts of color and composition ideas for larger or more involved things. 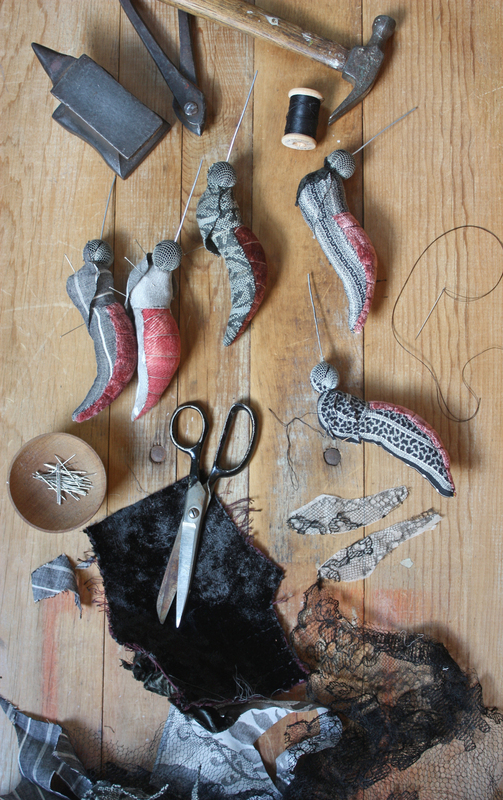 They have become morning work for me, hand sewing with coffee before I’m quite awake yet. I love having a little stack ready to go and waiting for me. 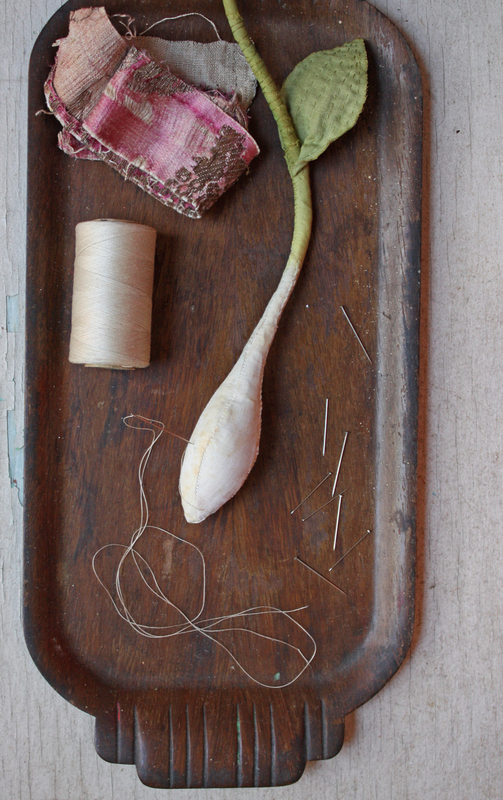 Do you pick up handwork first thing? What are you making? Can you give yourself a day or an hour or 20 minutes to play and experiment this weekend? The bodies are piling up as the owl shape is getting fine tuned. 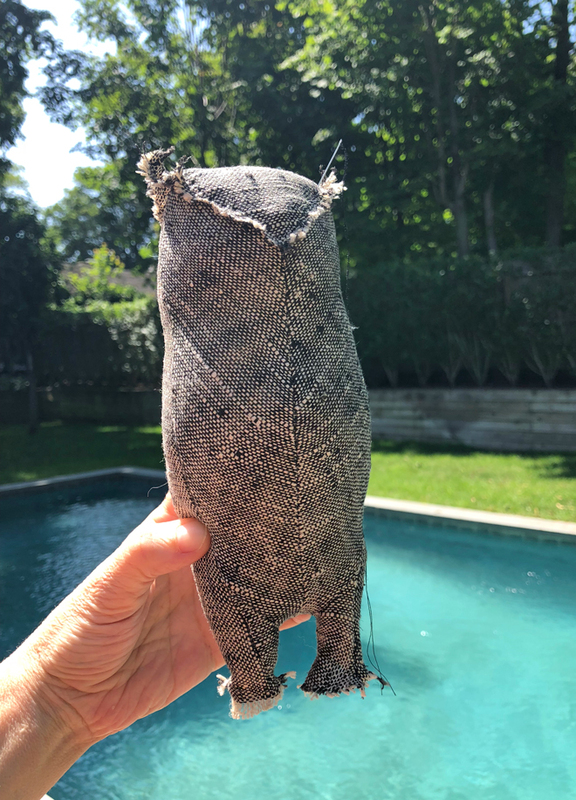 I’m preparing for owl workshops (PS – 2 spots have opened up in the 10/20-21 class) and ultimately a print and pdf owl pattern so every detail and dastardly proportion is being examined. I’ve started with the body shape. 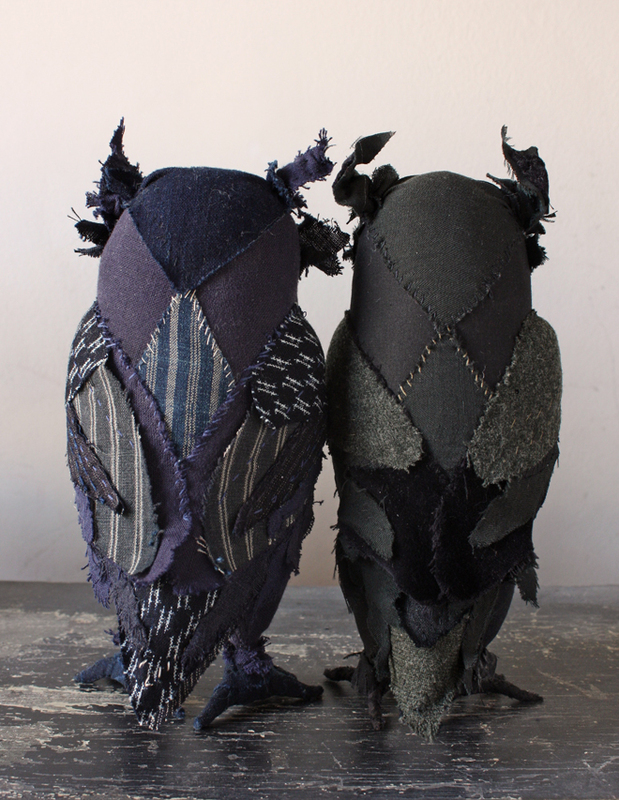 There are two construction methods I use for making owls, I created two patterns that produce slightly different shapes, one more rubenesque and another more sculptural and a bit more realistic. I might be the only one who can tell the difference. I tried to choose one to work on but ended up with a hybrid. The next step is to test and revise again and again until only what is essential is left, the shape is expressive, the pattern pieces assemble perfectly and any fussiness is removed. After each prototype I adjust and resew and if the adjustment is successful it is further refined in Adobe Illustrator. I arrived at the body shape that feels just right yesterday. And the body pattern pieces feel good too, it snaps together like nobody’s business. Even with difficult fabric like this odd tweedy stuff from mrs. brown’s skirt. I’ve been making things from that turn of the century skirt for 8 years and I’m sorry it’s is almost gone now. It has made lots of wonderful owls and rats and spiders but the weave is loose, thick, ravely and a little slippery, super hard to sew. I’m ready to move on to the feathers, feet and features. As I finish my little pile of owly bodies I’ll experiment with those details until each is transformed into a teachable technique and or pattern piece that produces reliable results. And the silly bug club! Thanks so much to everybody who showed up for the challenge. 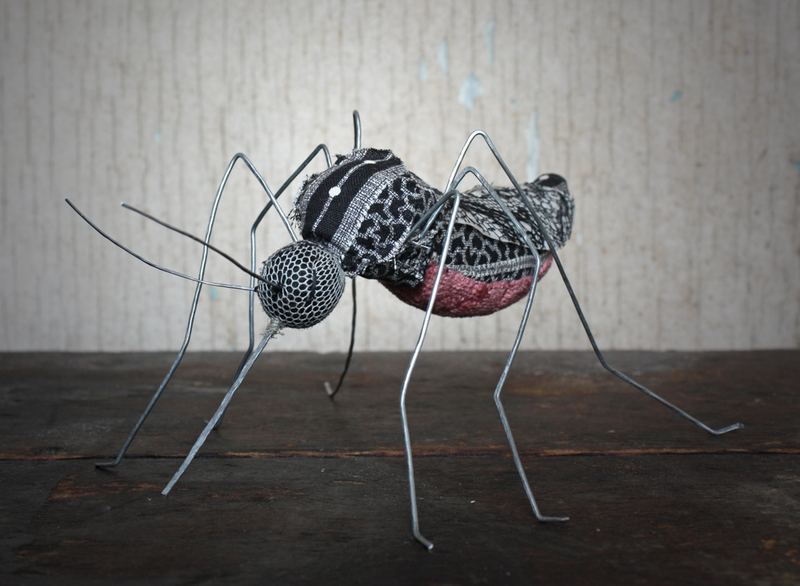 I drew a name from a hat and the winner of the mosquito rag doll is @bonniecapaulgallery ! I’ll message you on instagram for address etc. 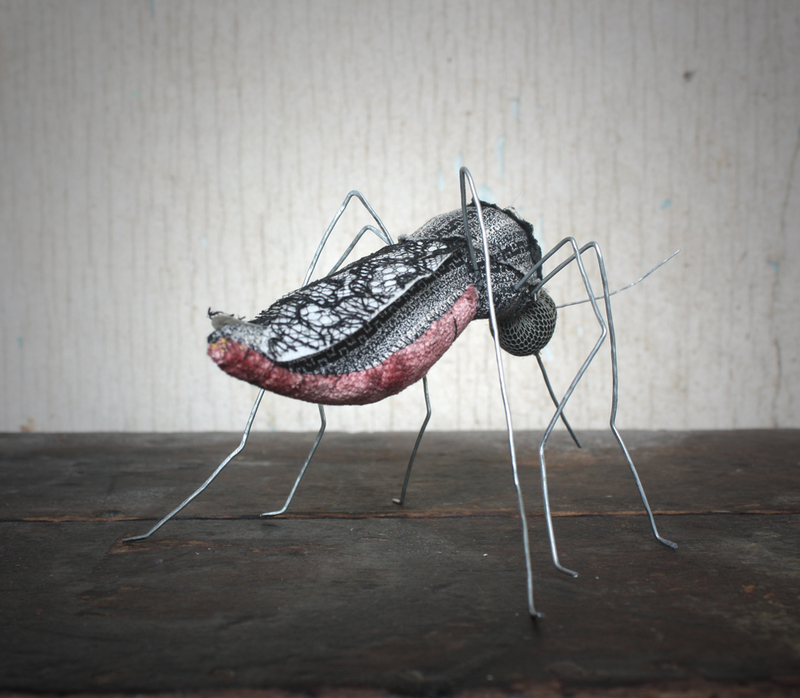 I hope you keep making and posting silly bugs, this was fun and I’ll offer you another challenge soon. 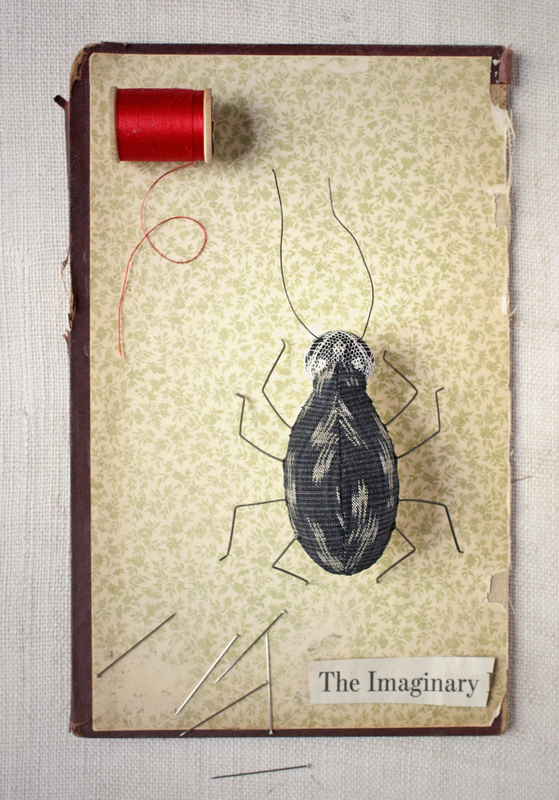 Have a beautiful weekend and I’ll leave you with a few highlights from the posts and you can check out all the silly bugs here. I’m in the woodshed with songbirds. Evaluating the pattern and steps, testing and adjusting little things – using what I learned teaching the workshops last month to make the pattern all I want it to be. I think it is my favorite place to be, in the woodshed with something. Discovering, testing and refining. Deep in a learning process. 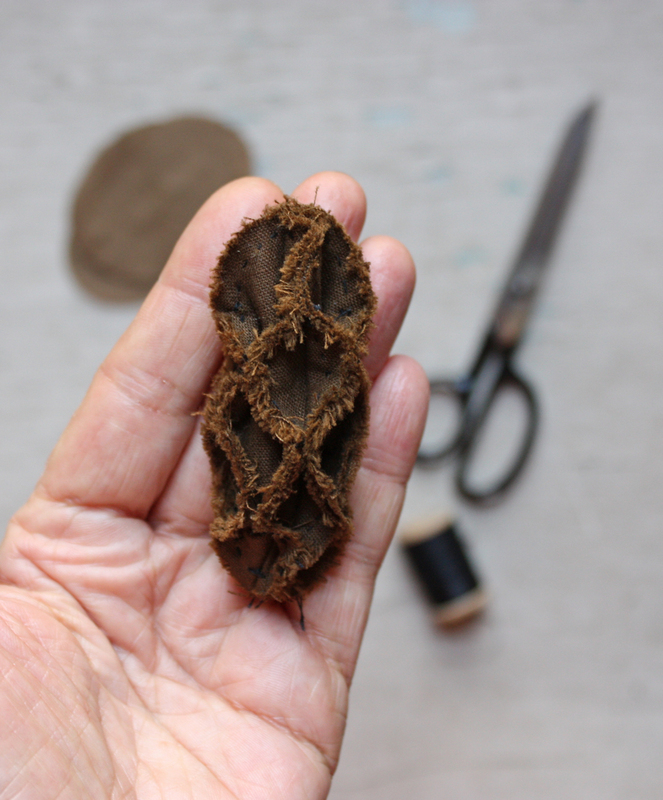 I’m also woodshedding owls to prepare for the dastardly owl workshops this fall (I think there are 2 spots left). Eventually they will also become a pdf and print pattern too. What’s going on in your woodshed? 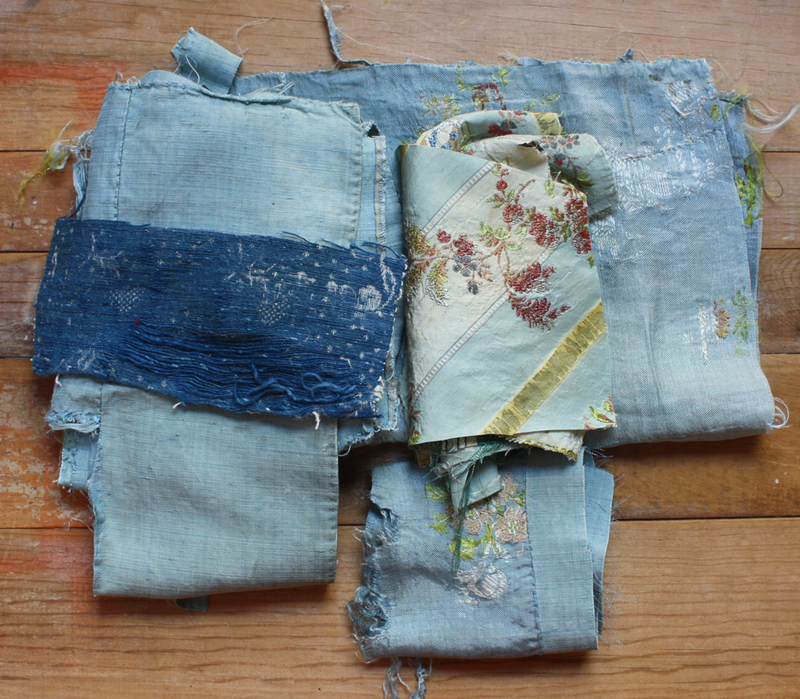 Another thing to love about small sewing, hand sewing, is how well it travels. I’m packing up some projects today and heading out of NYC to water and forests and people who have forgotten what I look like. It’s the first of several upcoming trips. This blue owl is coming. 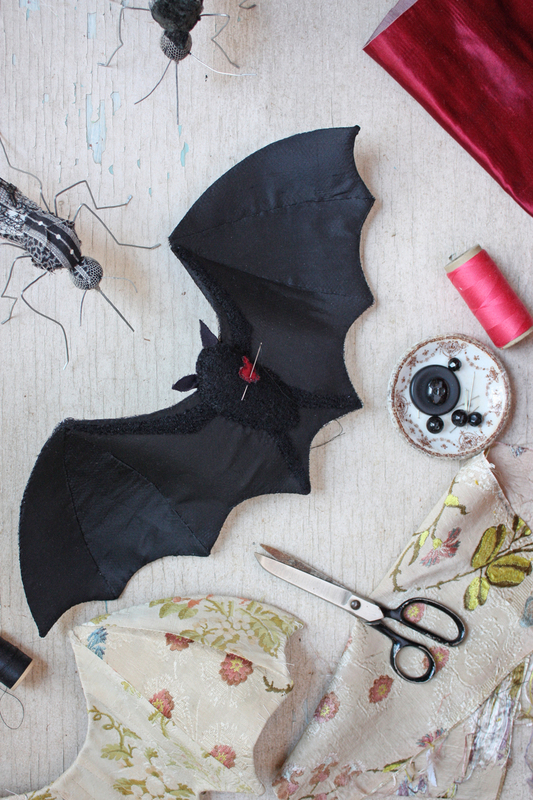 His indigo wings are all pinned up and ready for stitching. I love the blues, the variety, layered together Boro style. There is also some small blue appliqué work – I’m experimenting with eyes. More on that soon. 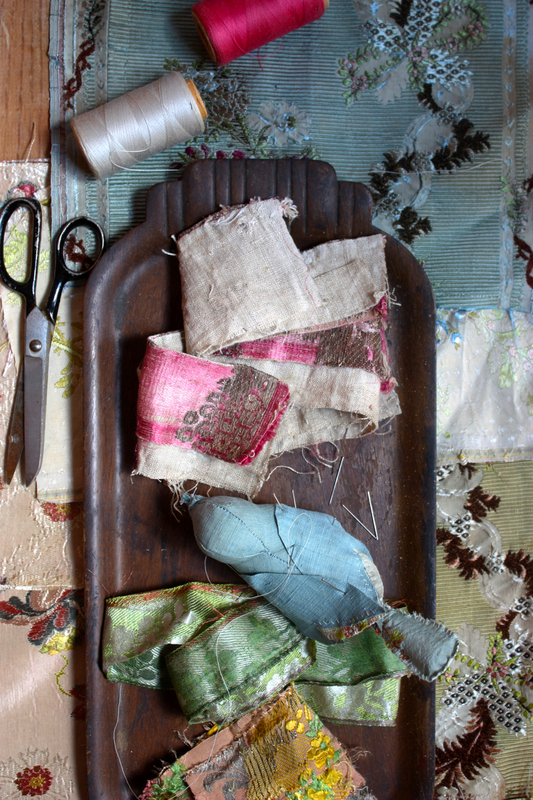 I’m bringing lot’s of mending too. The seats of my pants mostly. I’ve been wandering around Brooklyn lately with extra and unseemly ventilation. 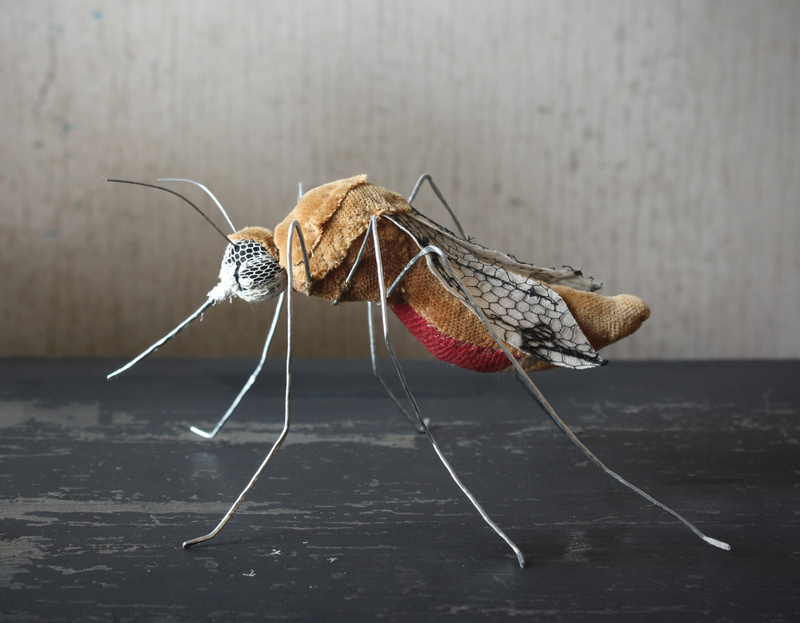 Most of my other upcoming travel is for workshops and I’m in serious last minute thinking and preparation mode for both of those – natural history with the makerie and diorama with Squam. 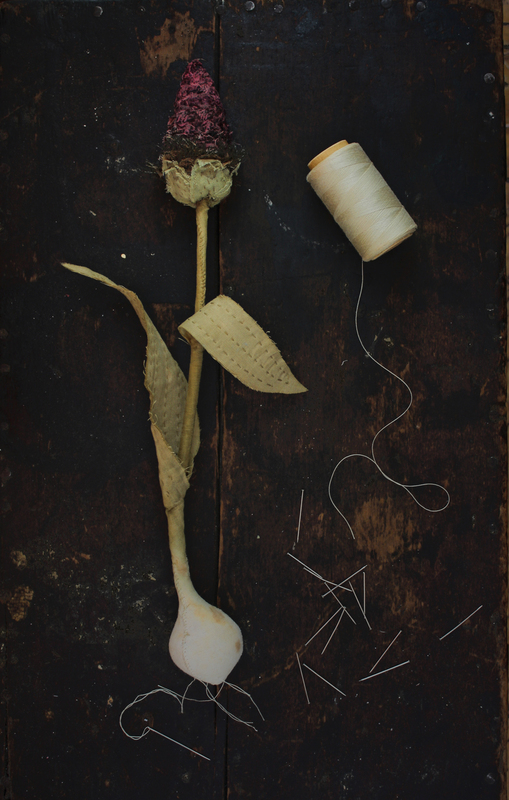 I’m spending some time with Joseph Cornell’s boxes and thinking about how things, objects, relate to each other, the moods and atmosphere and ideas those relationships can create and the poetry of things. They are ideas important to each of the afore mentioned workshops. 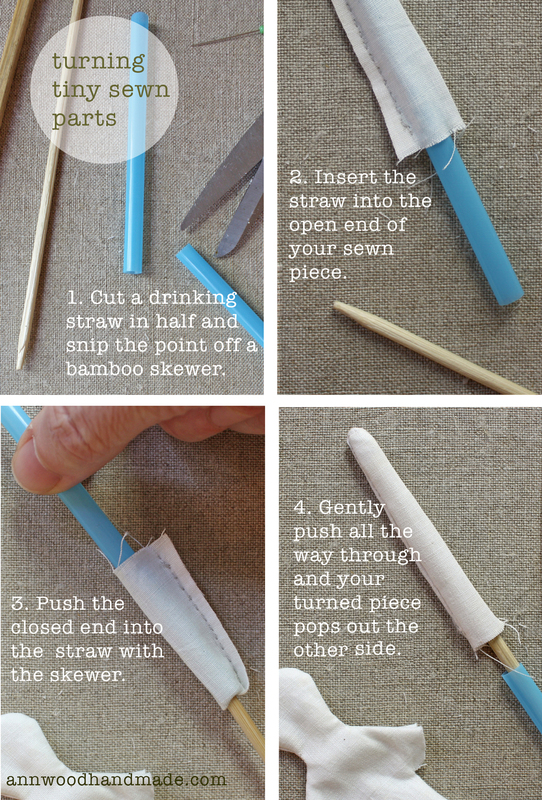 And I want to sit by the water and make tiny trousers. Tiny trousers for little lamb gentlemen. I find the little pants particularly satisfying – they are quick and there is just something about tiny pants. 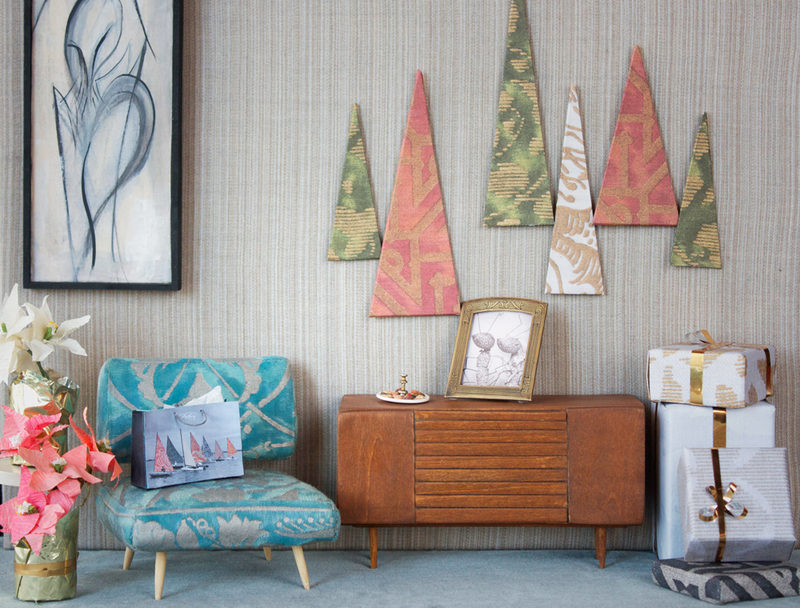 I want to come home with a little pile of satchels and pants. * Update – The workshop has sold out but please add your name to the wait list if you were hoping to join – cancellations do happen. 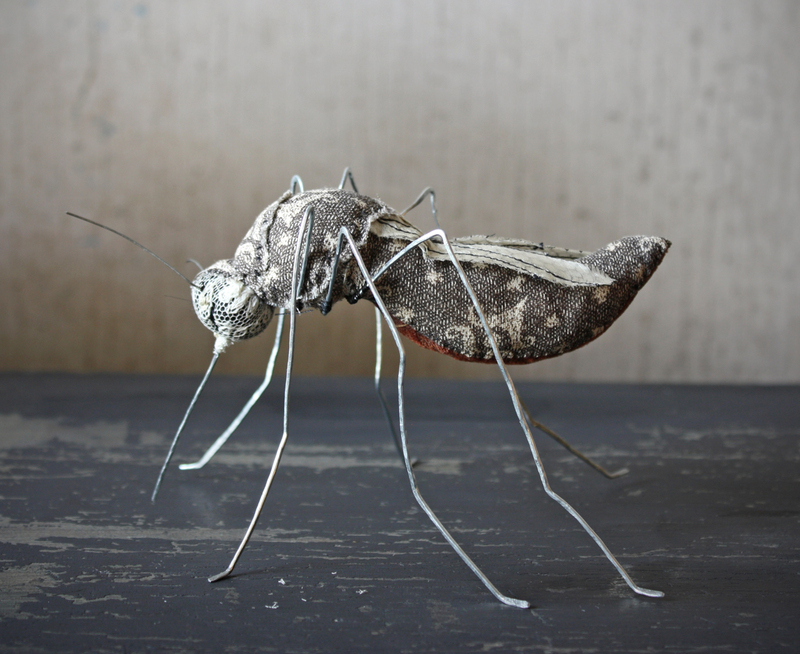 Registration just opened for “Natural History” a three day creative retreat with The Makerie in Boulder – September 22nd to the 24th. Our assignment for our three days together is to create and document an imagined natural history. 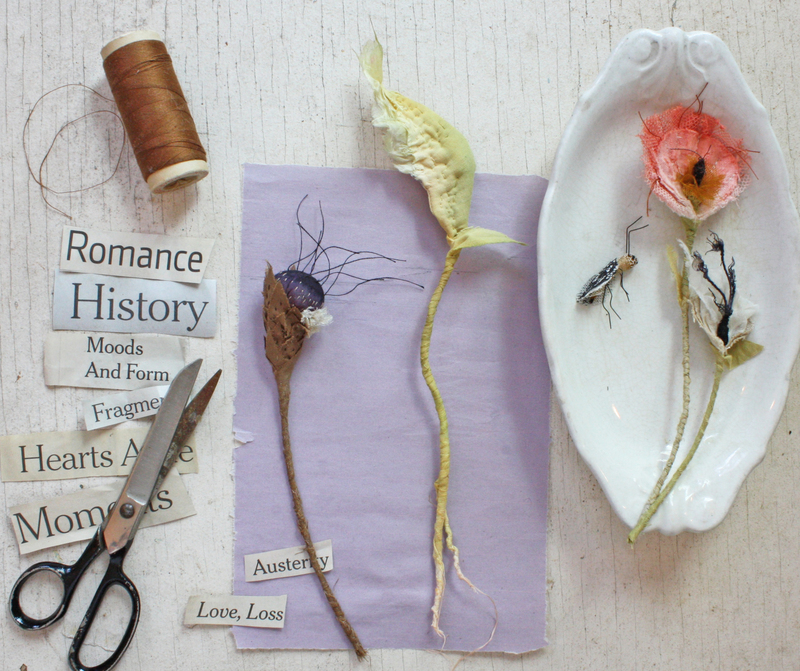 We will look for inspiration at the intersection of history, poetry and nature, working collaboratively as well as individually to create and photograph a collection of specimens. 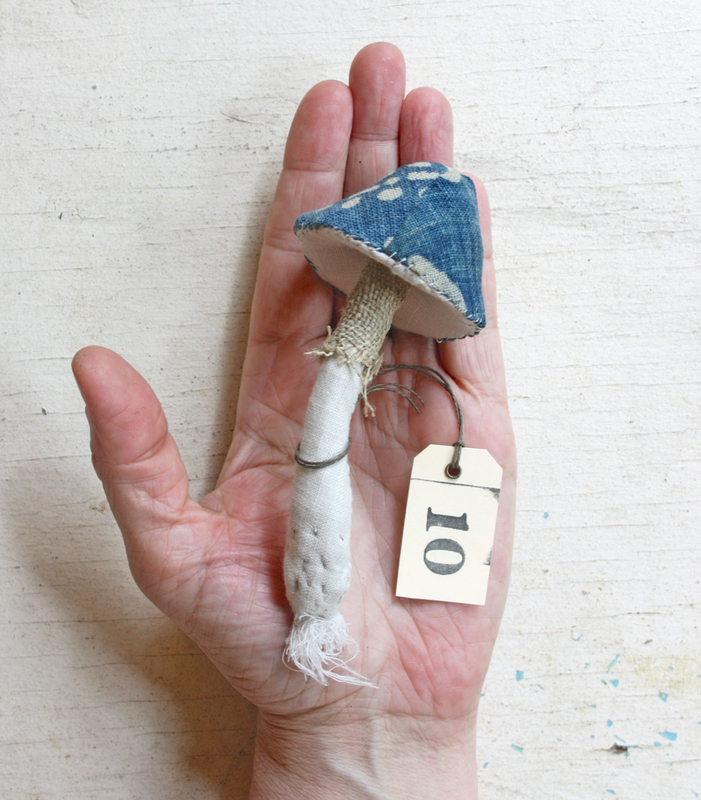 We’ll use textiles, paper, found objects and a variety of other tools, techniques, materials and inspiration I’m bringing. I’ll guide you through improvisational (and fun) exercises designed to spark you creatively, help you dig deeply into your imagination and generates ideas. It’s a spontaneous, “yes and” way of working – each action builds on the previous – you work with what shows up. It’s less about finished works and more about making connections and recognizing serendipity and happy accidents when they appear. We will pull ideas and details from our experiments as a starting point for designing and making our plants and creatures. On our last day together we will style and photograph our specimens individually and as a group. I’ll share tips for creating compelling compositions and moods, simple lighting hacks and other seat of the pants techniques that I use in photographing my own work. This is a workshop about experimenting, collaborating, playing and getting out of your own way. That is a life long daily challenge for me and I love sharing what I’ve learned so far. I hope I can help you be a more intrepid explorer of your imagination, reach past the territory you’ve already navigated and expand your skills for sharing that world. Sounds like fun to me and I hope to see you there! If you’ve got questions please send me a message – I’m happy to help. *registration has closed but you can still join the wait list here. I have been bothered by bats for a very long time. They were one of my first stitched creatures. I love them but vowed to never make another. The process was brutal on my hands and had a high late stage failure rate. And they took an outrageous amount of time. But I love them, I love their shape, their curves and the way that shape seems to change as they twirl in the breeze and the lovely shadows they cast. 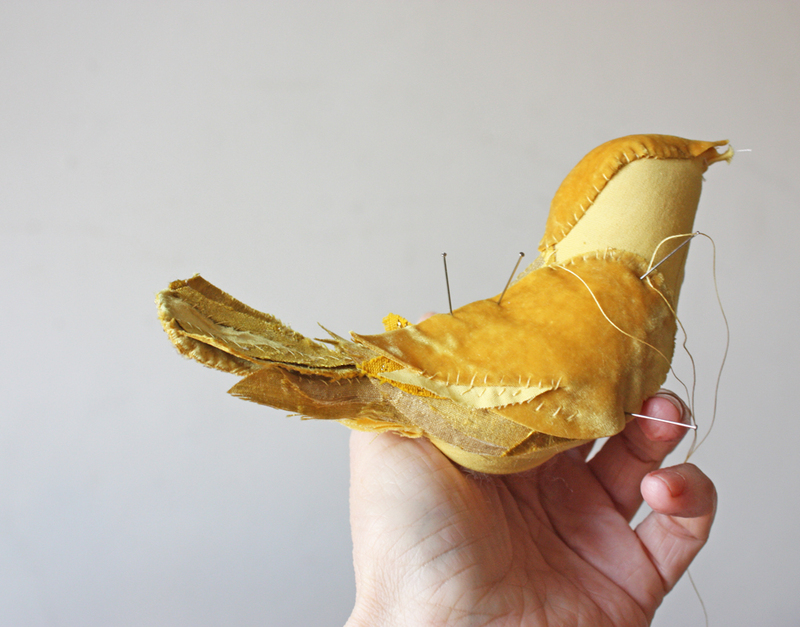 So lately I started from scratch – a whole new method of constructing them. There have been several dismal failures but in the past week I’ve landed on something good -. It’s much easier hand-wise and the result is reliable and consistent. It still takes forever. Not as bad as the original bats but still problematic. I’m not sure I can get to a place where I can produce them with any efficiency but I’m not done trying. A blog anniversary snuck past in February – 11 years. When I did remember I thought maybe I didn’t really have anything to say about it. But the comments about the machine on last week’s post changed my mind. I remembered what a part of everything the machine has been. I remembered the serendipity, the sweetness and steadiness of it’s presence in my life and work. 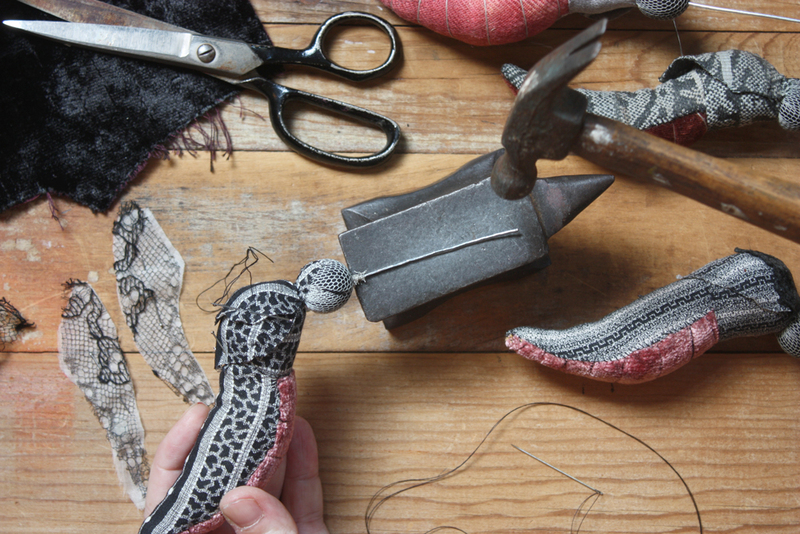 In December of 2006 I had just begun my solo enterprise – I had lots of orders and deadlines and on the eve of one of those very important deadlines I was still sewing furiously very late at night. With a long way still to go the machine suddenly stopped and a chunk of metal rocketed past my face. 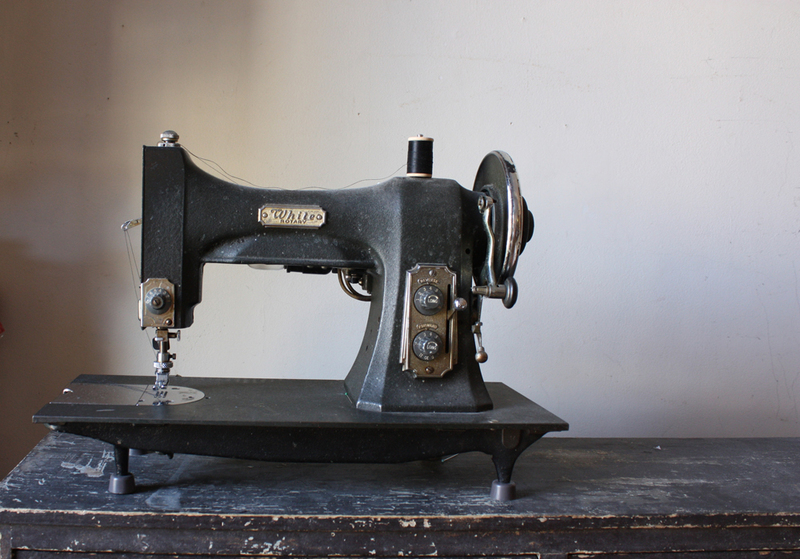 I found it across the room – an essential part of the machine – no sewing without it – and it was broken. I tried to fix it but nothing worked. I have a drawer full of bits and pieces that I saved from my Father’s workshop – bits of metal and rubber, knobs, washers, gears, springs etc. I thought maybe I could cobble some temporary solution together from those. Another hour of frustration and no luck at all. Exhausted, defeated and ready to give up I pushed the drawer closed and it stuck halfway, I pushed again and it stuck again, I pulled and it stuck. I gave a great big angry pull and the drawer flew out and what had caused it to stick also flew out and landed – right in my lap. To my amazement and disbelief it was a replacement for the broken sewing machine part – the exact part – identical but for the color. Not similar, not “good enough” the EXACT PART in perfect condition. I snapped it in and it worked beautifully, that night and all the nights and days that have followed. And – a little bit of what I’m working on today. 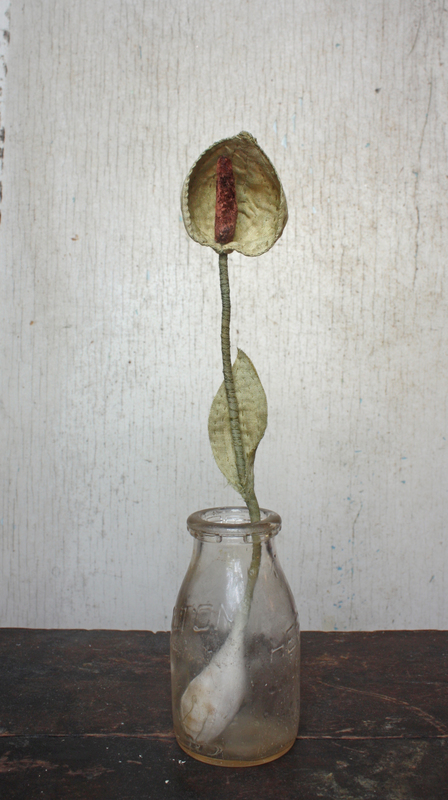 New botanical experiments. 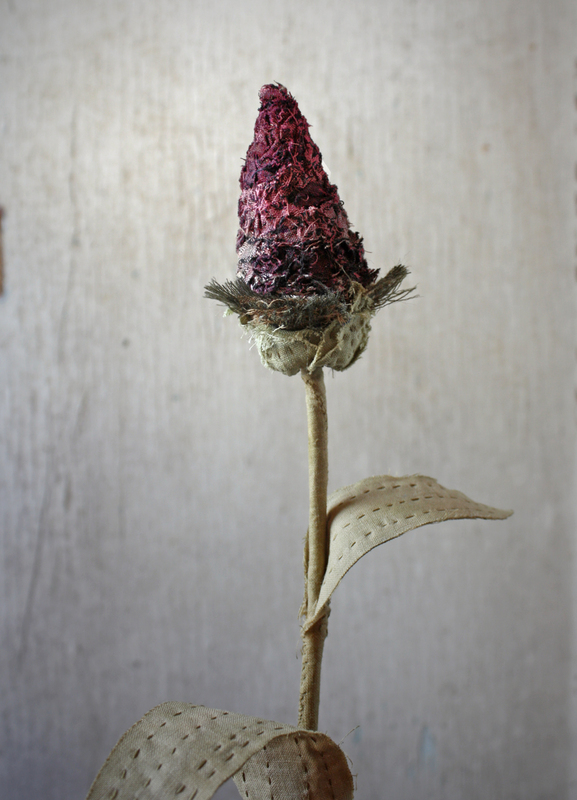 I think the one above will be a pink cloaked bishop lily and below a seedpod experiment – playing with the idea of honeycomb texture. I’ve got plans for more and I’ll show you next week. 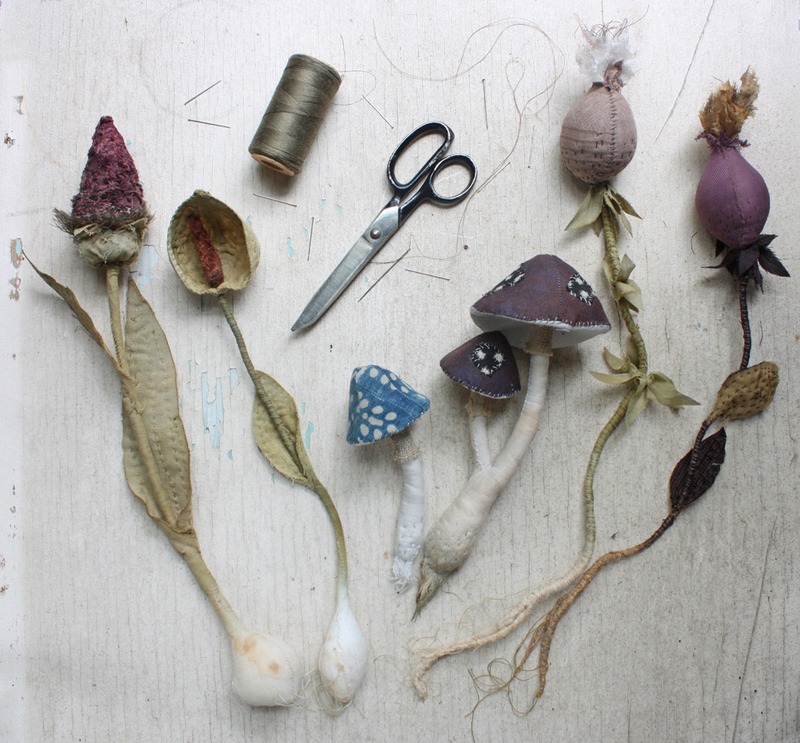 I’m also planning on a shop update next week (postponed for a bit) with botanicals and some creatures. You can sign up here to be notified by email when new items are available. 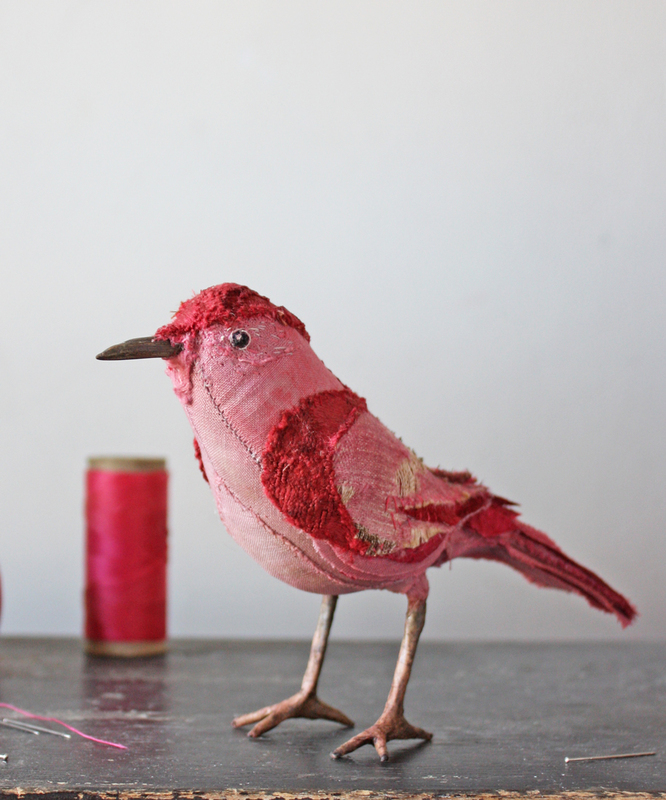 Find the sewing pattern to make this songbird here. 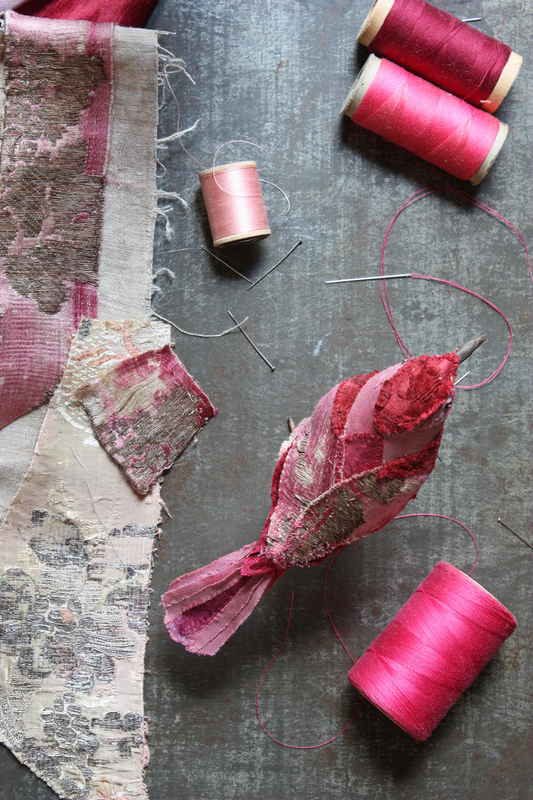 My favorite textiles have been the ones that find me. They bring colors I could not imagine. 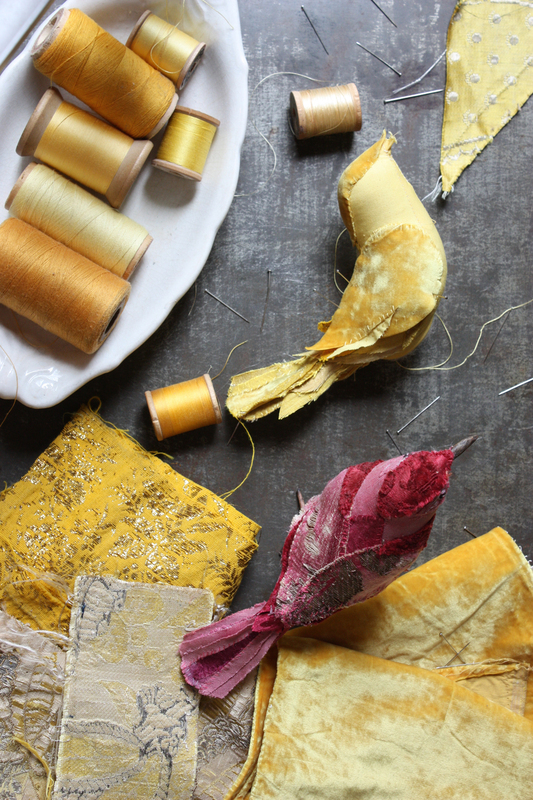 These 18th century pieces (a beautiful gift) are mesmerizing and expanded my understanding of what yellow and pink can be. This is yellow that sounds like trumpets, bright, triumphant trumpets and pink and crimson that sound like weeping violins. 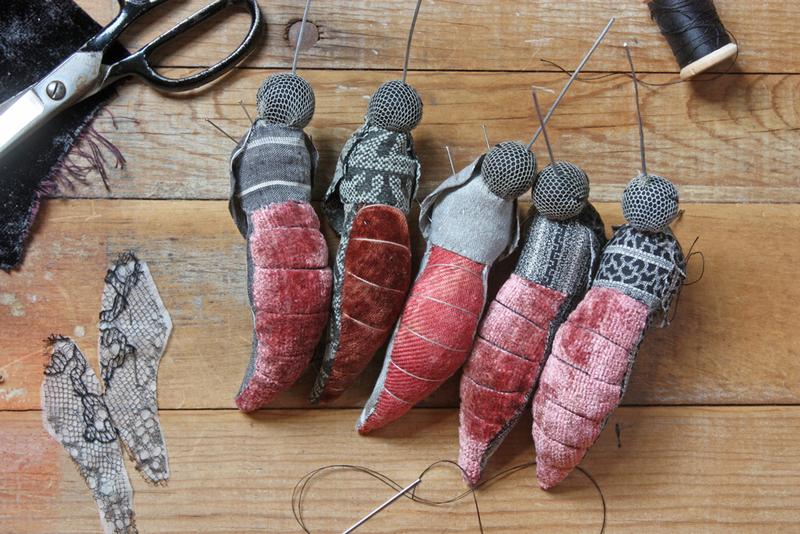 I’m making songbirds and trying hard to do the colors and textures justice- they have waited such a long time. 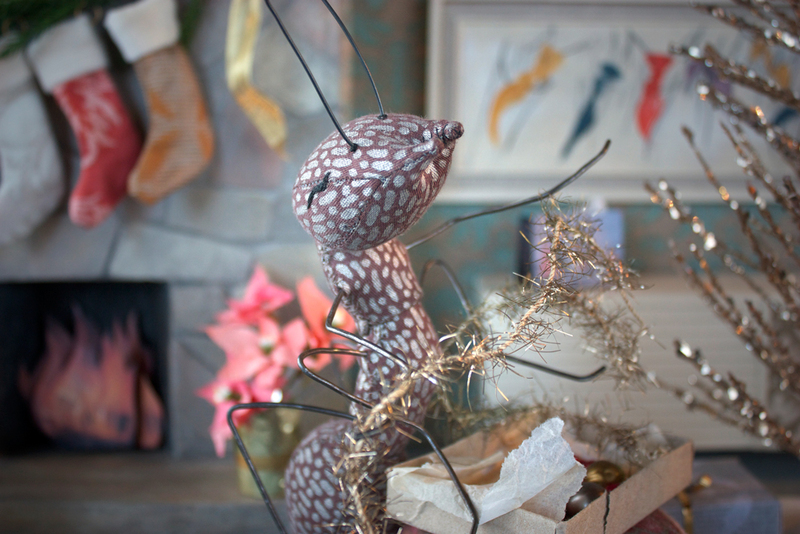 The Beaumonts are ready for the holidays (if you have not yet met fifth avenue’s most stylish anthropods you can learn more here). 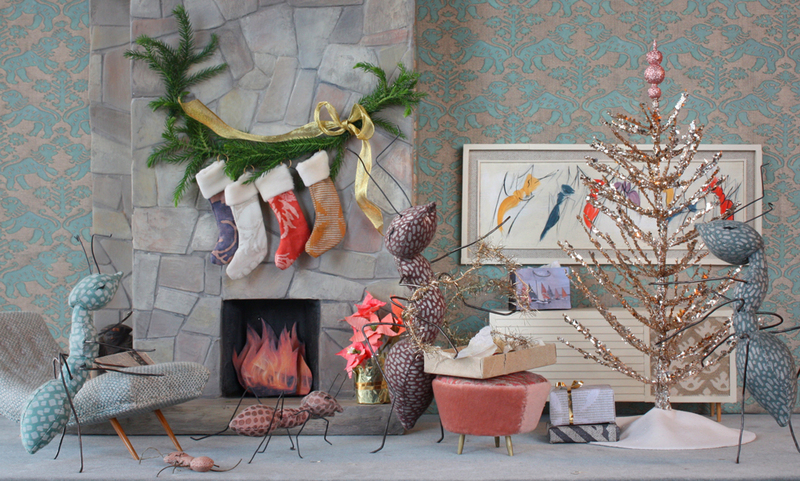 Tiny Fortuny stockings are hung, presents are wrapped, cookies baked, hearth blazing and the whole family is trimming the tree – such festive ants. 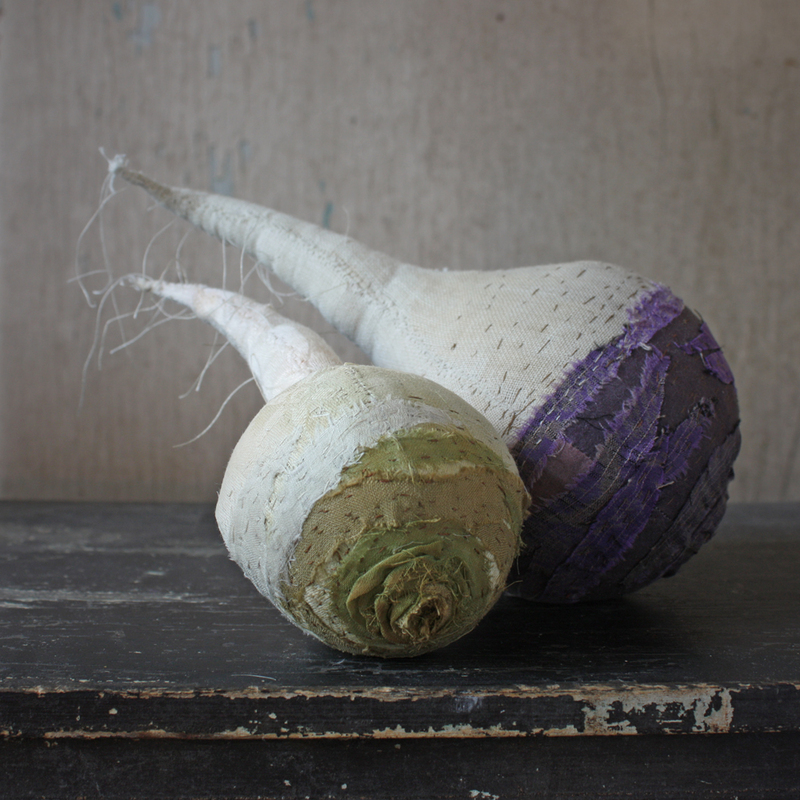 A heroic root vegetable – the majestic turnip. 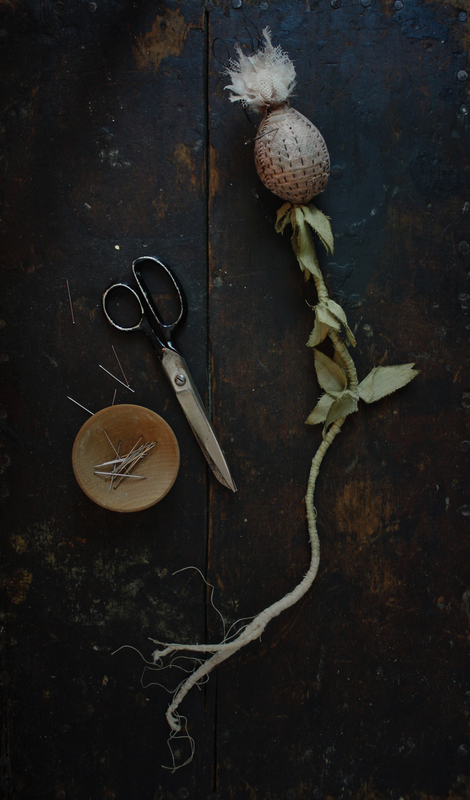 I love making these – rutabagas and turnips – the stitching is meandering and meditative and I like experimenting with textures and layering. 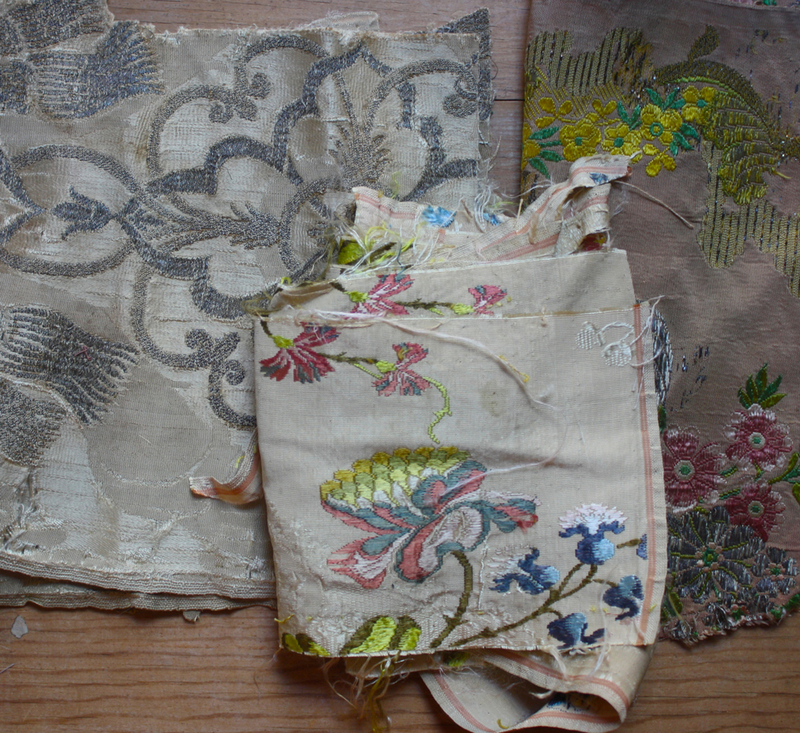 I have found that antique table linens are ideal for making the shape – the cotton is thick and there is a little sheen. 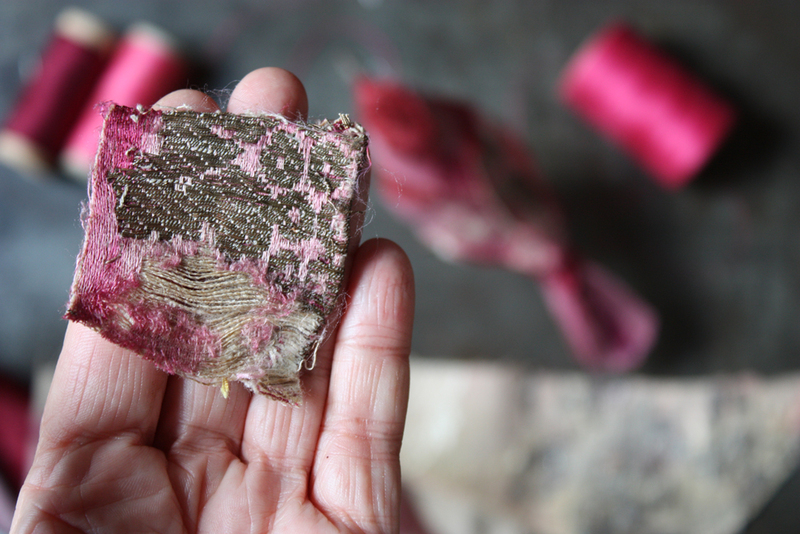 I layer sheer cottons – often pieces of antique kimonos and lots of stitching to add color and more texture including the rough edge where the leaves were chopped off. That’s my favorite part. PS – I’m teaching a class on this very subject in the spring in NYC – at the Sweet Paul Makerie. And do you remember the wolf? He is among a little group of things started over the summer that finally got finished and photographed this week. He doesn’t look so bad…. He looks sort of pleasant. But do not trust him – there is a dark side. 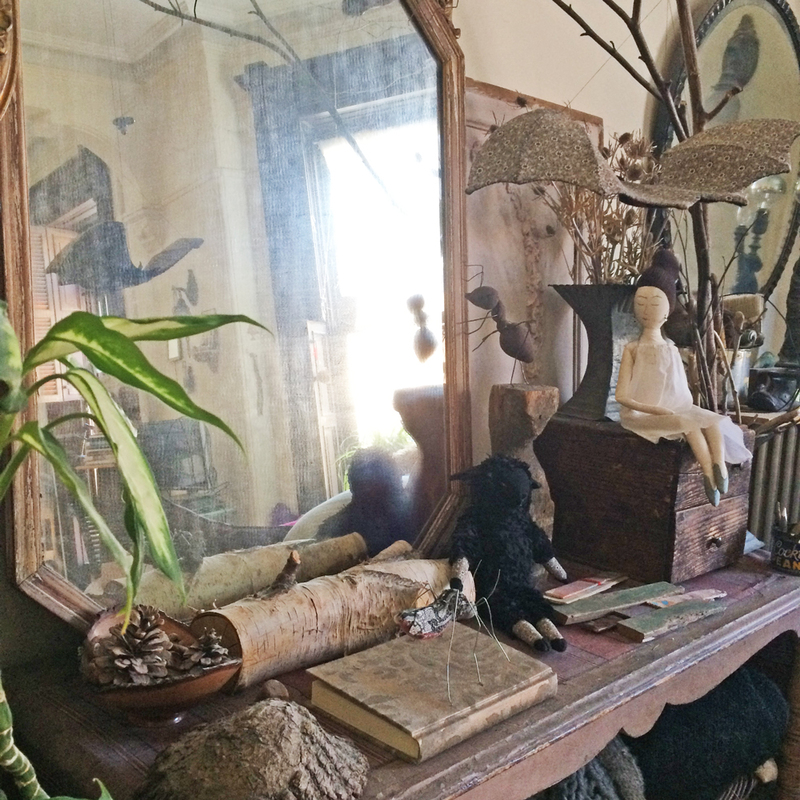 Can you imagine – the hands that wove and embroidered them, the rooms they decorated and moved through? 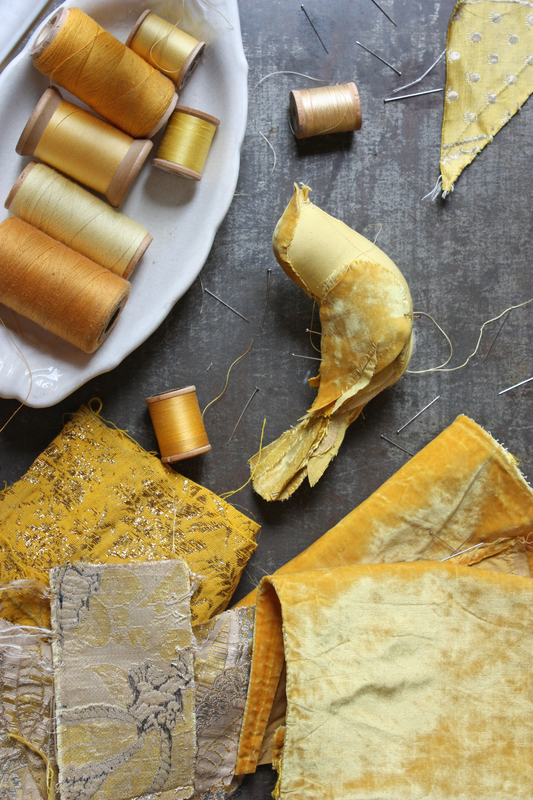 I am mesmerized by these textiles – most from the 1700’s – the vermeer yellow velvets below are 17th or 18th century – the goldenrod piece with gold lame roses is French 19th century. The colors are intense and I wish you could feel the texture – the weaves are thick and tight. 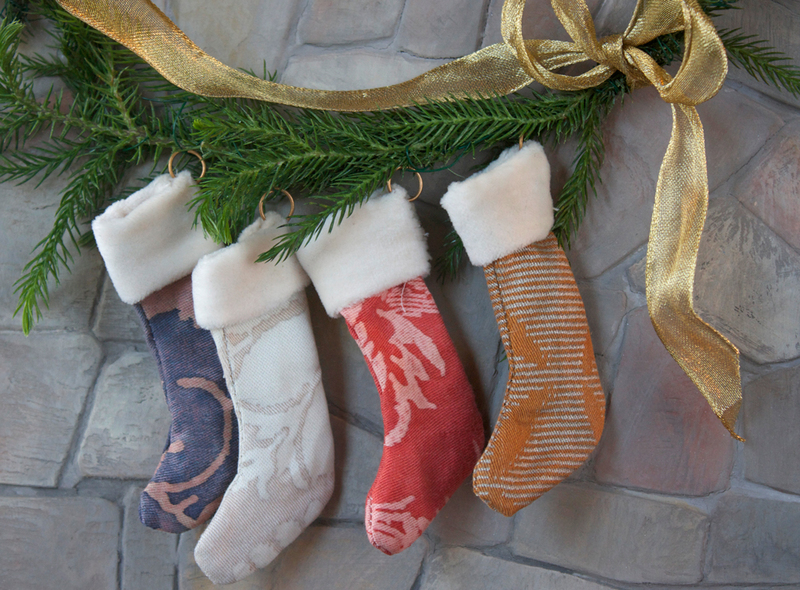 I wondered if they would be sewable and they are – amazing. 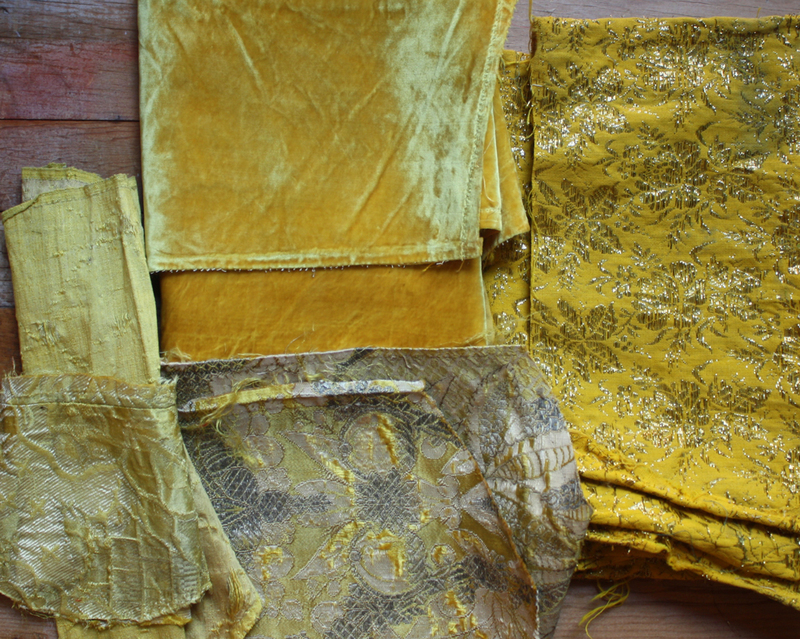 They came as a complete surprise – I have remarkably good luck in the fabric department – this was an incredibly generous gift from Trish Allen of Trouvais – a collector’s shop of rare and special early textiles – lovely, inspiring treasures – the antique ballet costumes – oh my. The box has been here for weeks and I take them all out and look at them almost everyday. 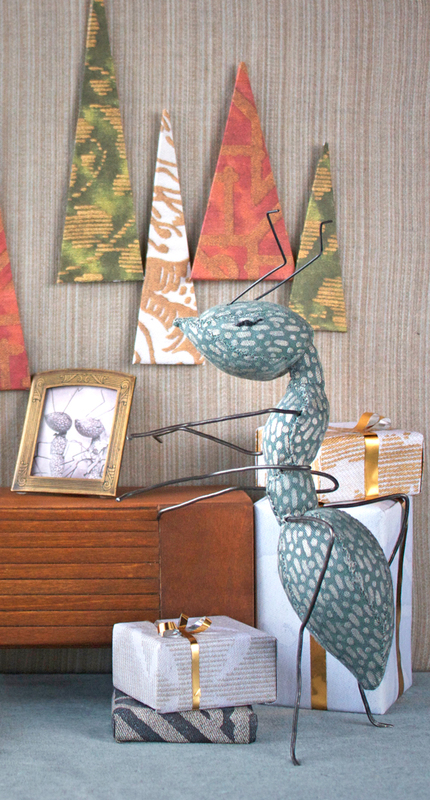 I only photographed a few things today – I might show you some more tomorrow – along with a new creature I’m working on. 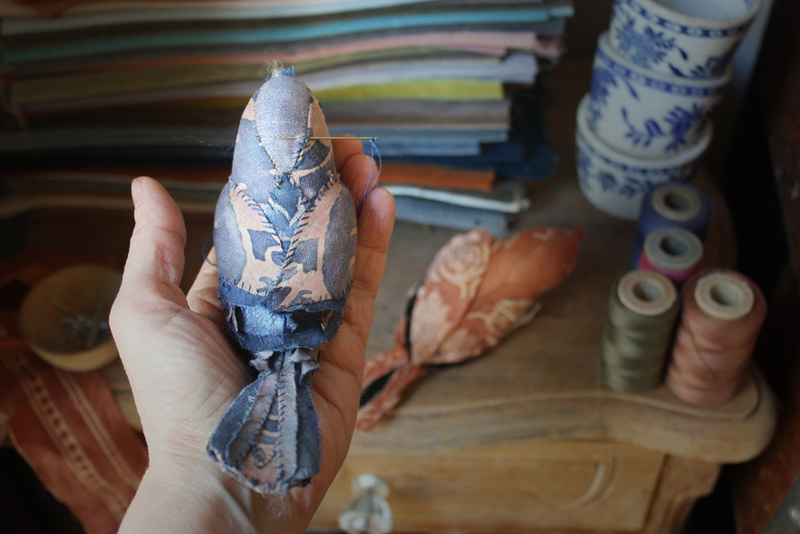 I started my first project today – a french blue songbird made from an embroidered 18th century silk. 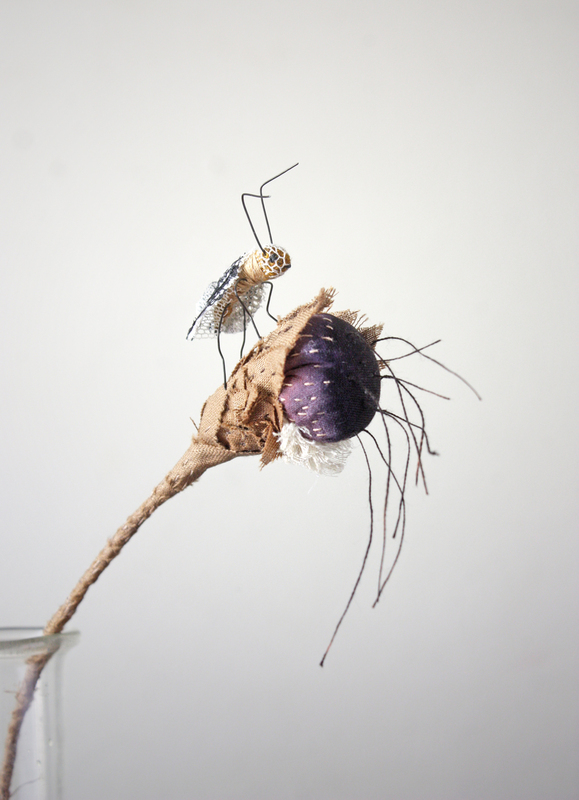 Next will be mosquitos and I think something botanical. 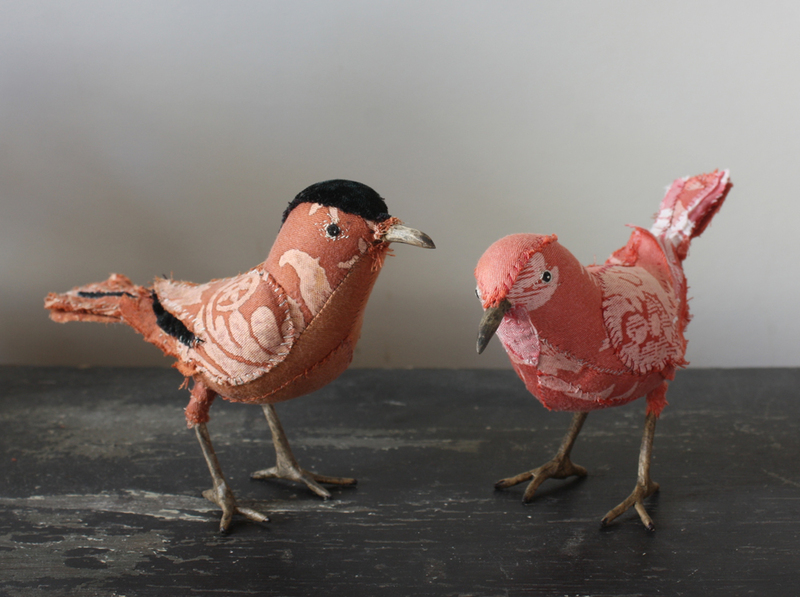 And speaking of songbirds – a new crew of Fortuny birds – here they are discussing some important songbird issues. Maybe it’s my favorite – or maybe tied with March – I like the blustery months. It is just so extraordinarily pleasant – perfect days. And I’m sewing a ton – hours and hours of hand sewing every day after a longer than usual phase of other things – planning workshops for next year, teaching, making sewing patterns etc. – there was a lot to swim through so I could sit and sew again. 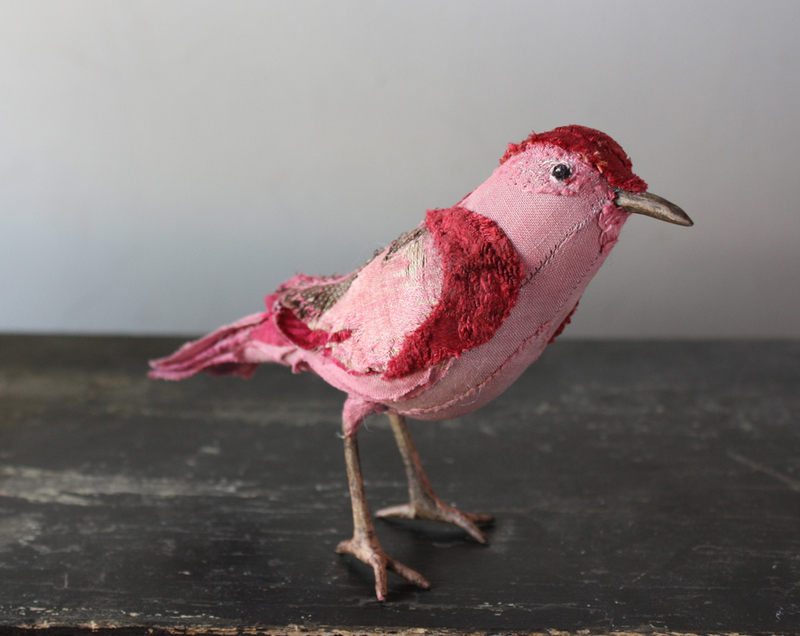 I’m making lots of songbirds- some Fortuny – like the birds above and some from antique garments. 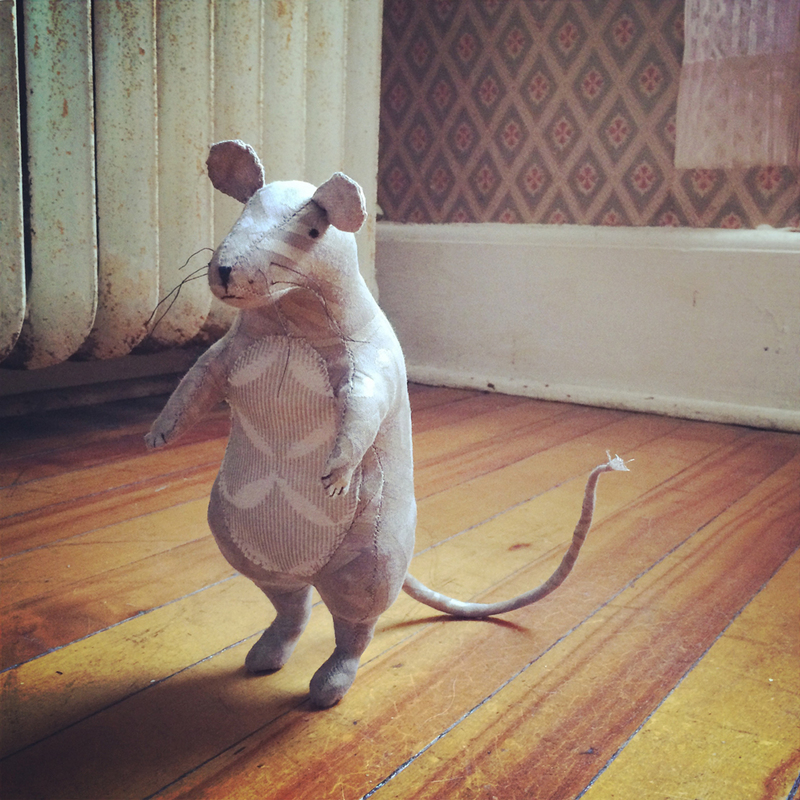 I’m also making owls, and rats, building ships and working on a new shape – a new creature. 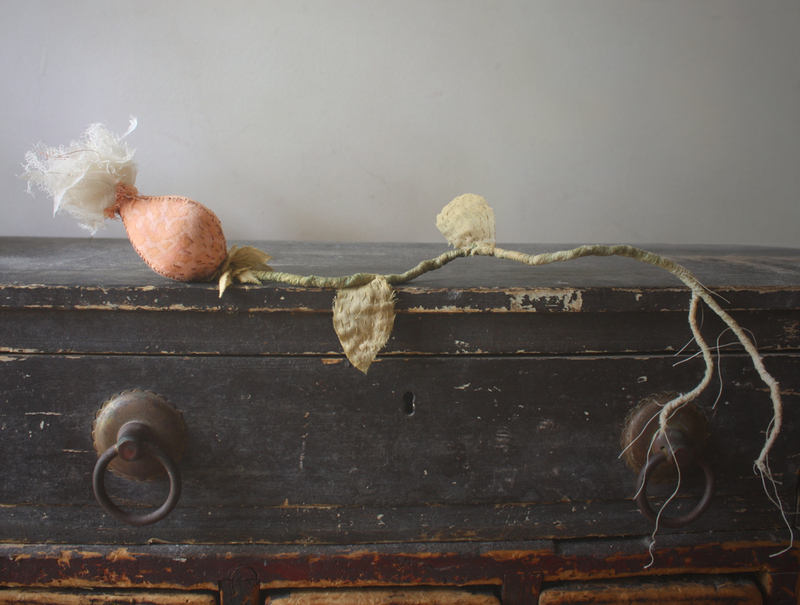 Most of the finished things above are headed off on a special mission in the UK but I do plan to have lots of things in my shop soon and will be sending creatures to the Fortuny showroom in Manhattan next week. 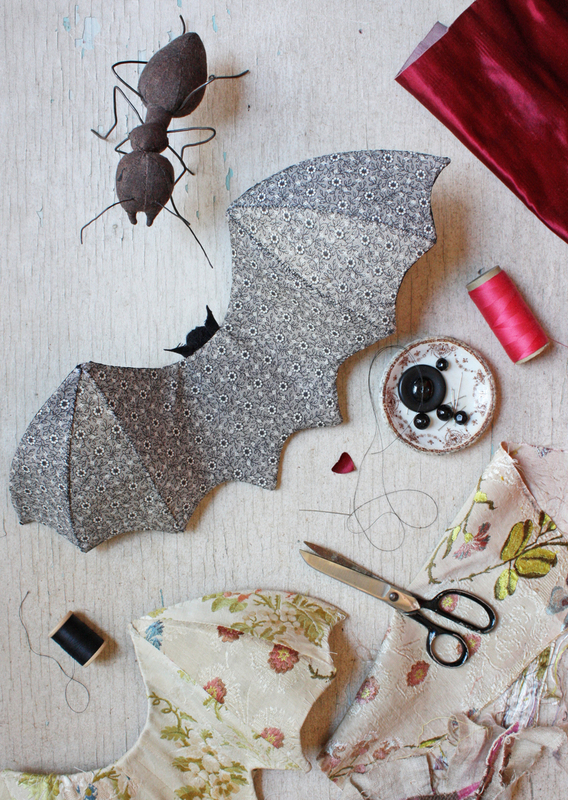 And check back for progress on the new shape I’m working on – it is another of the often less loved creatures and one I have a complicated relationship with……. update – the tiny doll sewing pattern is in the shop. 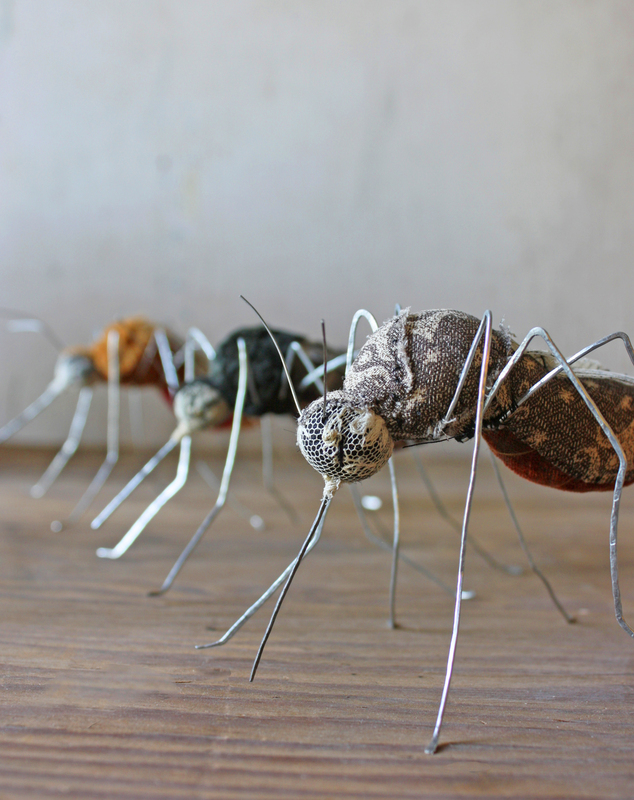 Besides pattern and workshop making work I have some mosquitos on my worktable. 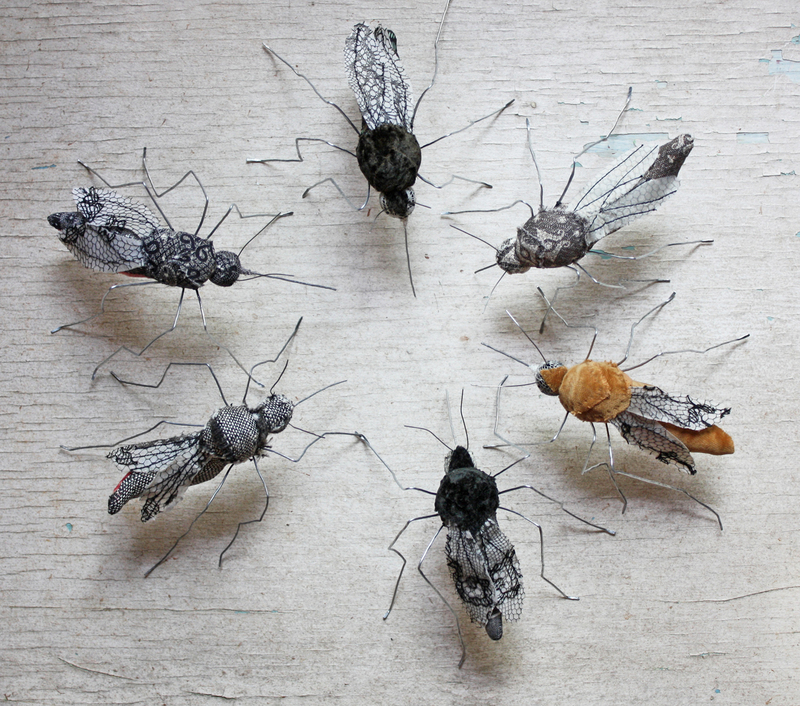 Mosquitos are slow, detailed work that involves lots of pins and stabbing myself repeatedly with various instruments – the five below have been in progress forever and are finally in the homestretch. They suffer such indignities – this poor girl is having her proboscis hammered. I hammer the wire parts on a tiny anvil to stiffen them after shaping and make them a little textured and sparkly. 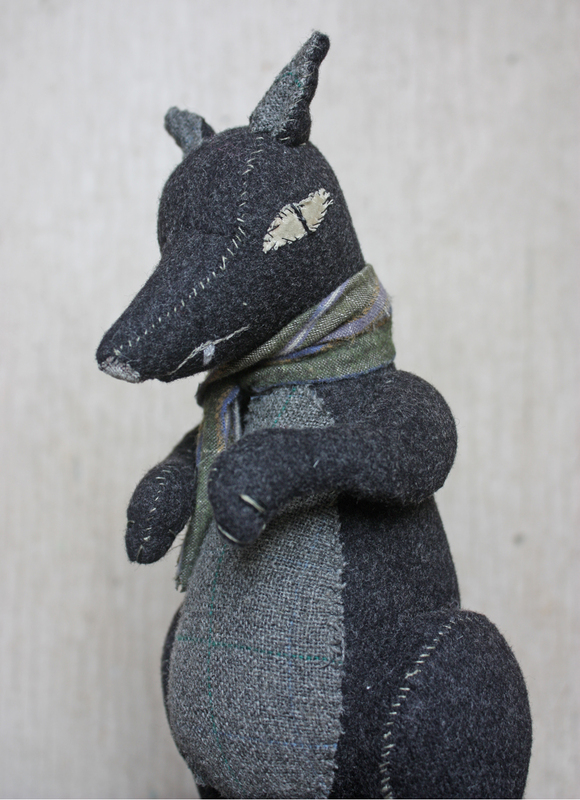 Three of these Edwardian pests will end up in the shop sometime in the near future and the other two are going on special missions. 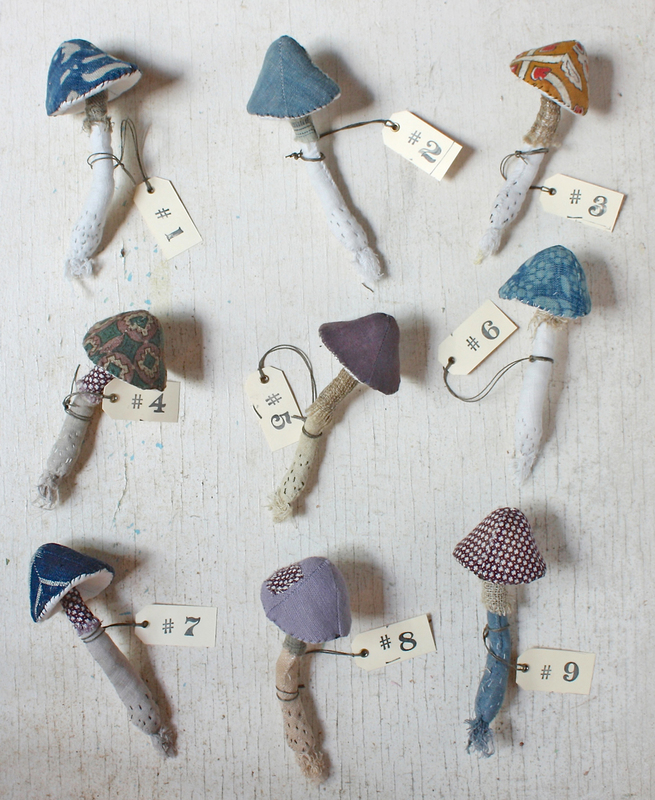 If you’d like to be notified when I have new pieces available you can sign up here. I love the idea of him practicing his dance steps with the mirror – nice work Lourdes! I’m working on mostly top secret things right now – holiday stuff, 2 brand new workshops for next year and the tedious parts – formatting, editing etc. 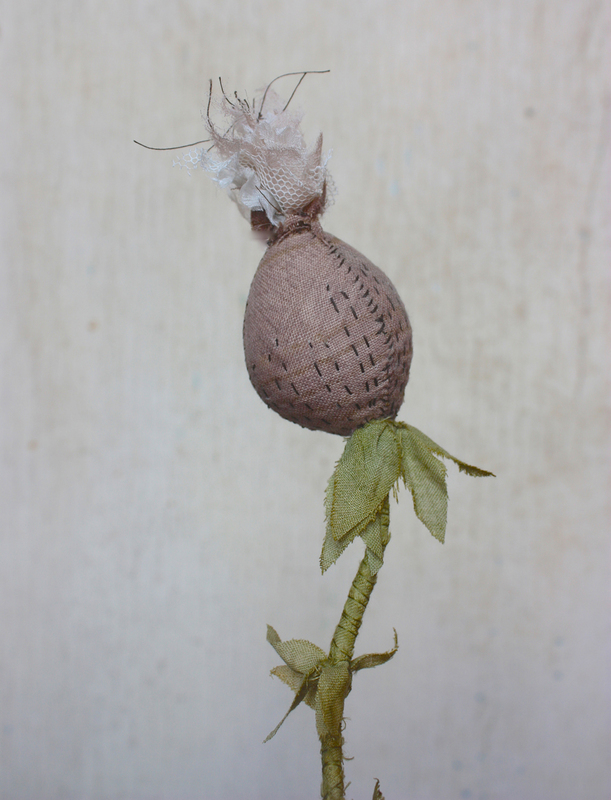 – of creating the rag doll and seed pod patterns. Since I can’t show you what’s on my work table it’s the perfect time for a caption contest. 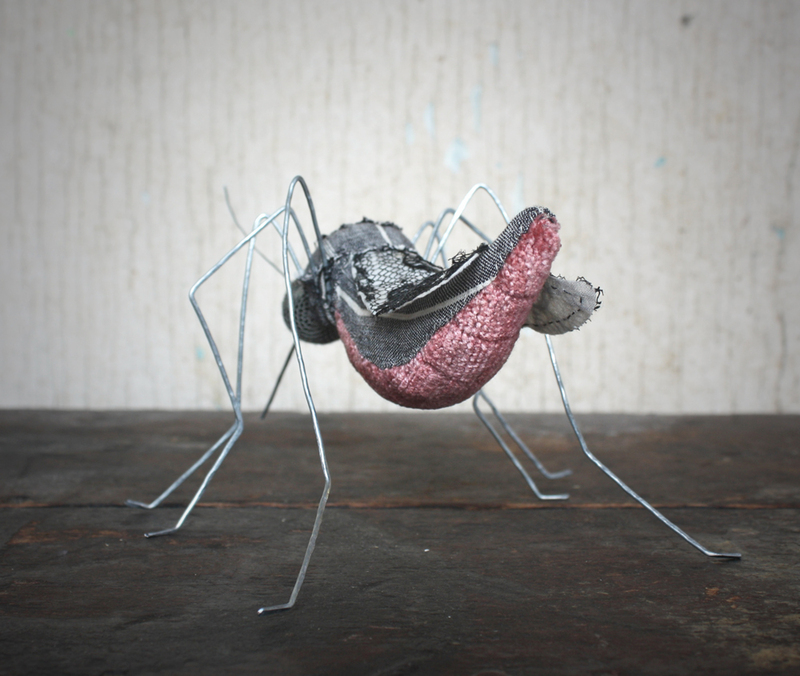 I try to make creatures whose expression and body language imply a history – a definite point of view, a world of their own. And I like to photograph them in a way that invites you to wonder what’s going on outside the frame. This is one of my most favorite photos – taken last year in the Adirondacks. 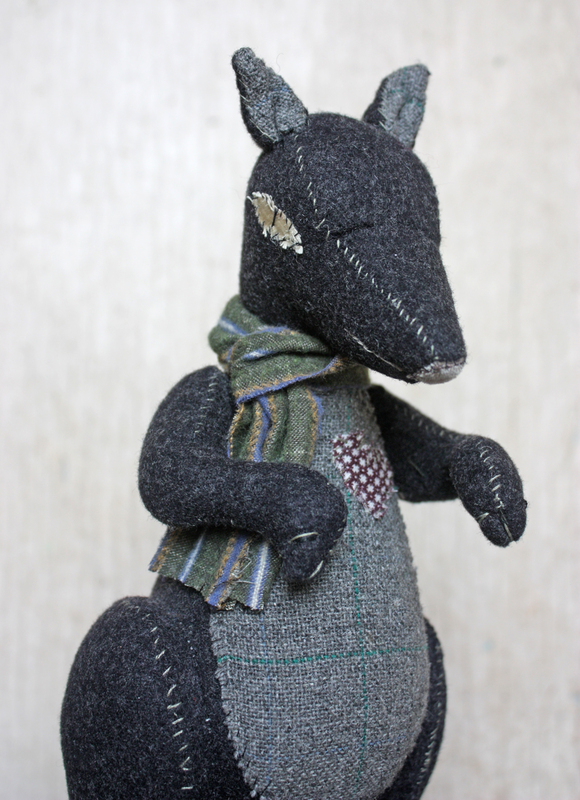 What do you think this dapper rat is up to? What’s on his rat mind? Make up a caption and leave it in the comments to this post – an esteemed panel of judges will choose a winner to be announced next Thursday. Everybody is welcome to enter – please leave your caption comment before Wednesday 8/3. 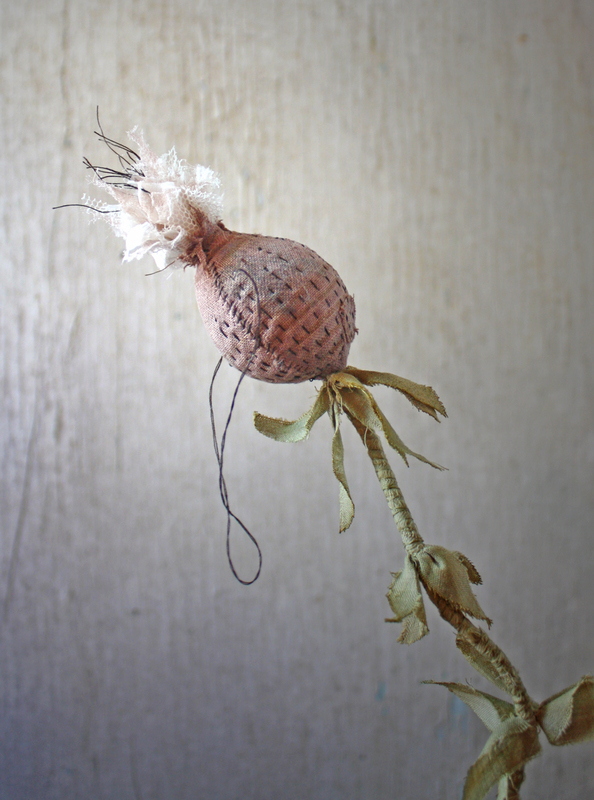 And the prize – a Fortuny seed pod! 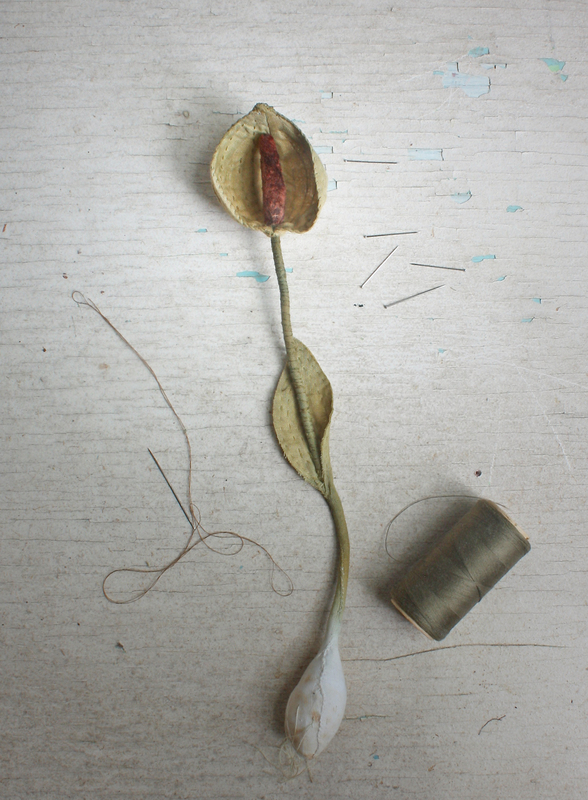 Such a tragic flower – gone to seed – collapsed in a pretty heap. 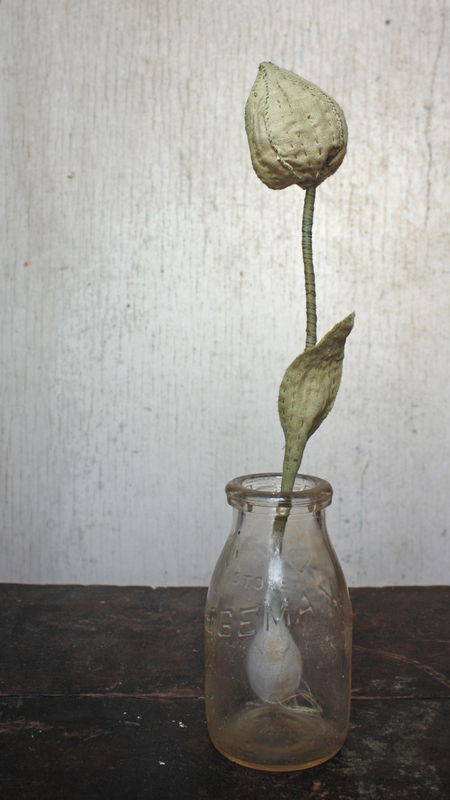 I’ve been experimenting with new botanical shapes. The flower below is the rare cloaked Bishop Lilly – it only blooms at night. If the moon is full. Once every ten years. And only for an hour….. There are also seedpods, toadstools and another rare specimen the Royal Cone Flower – valued for the rich crimson bloom as well as it’s medicinal properties – it’s petals make a potent sleeping potion – it is found only in the Black Forest and is nearly extinct. You can find the sewing pattern for the little toadstool above right here – I printed the pattern at 50% for this little guy. 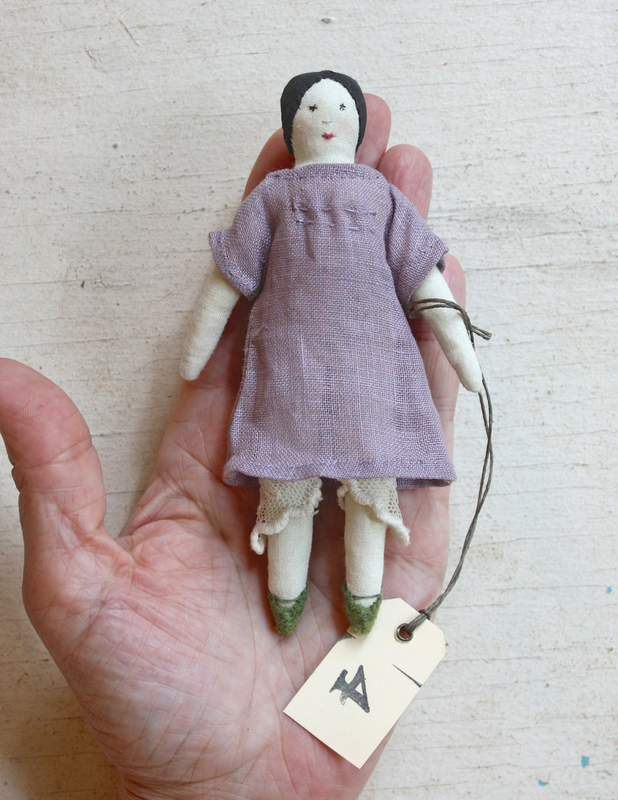 And among all the strange flowers – tiny rag doll #4 – miss lilac. This big pink flower woke me up last night. 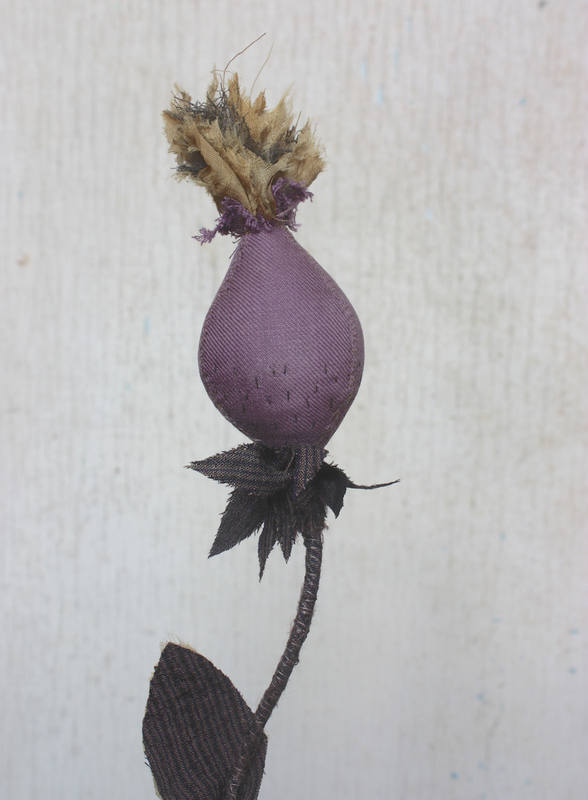 It’s one of the new botanical experiments I’ve been working on and it was finished but I didn’t love it- something wasn’t right. 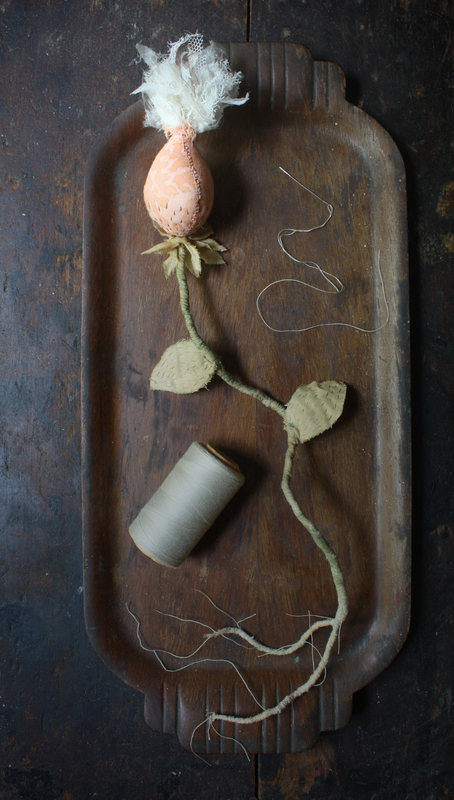 The original stem and roots felt too delicate, too fussy for the flower and out of balance – that idea would not leave me alone. 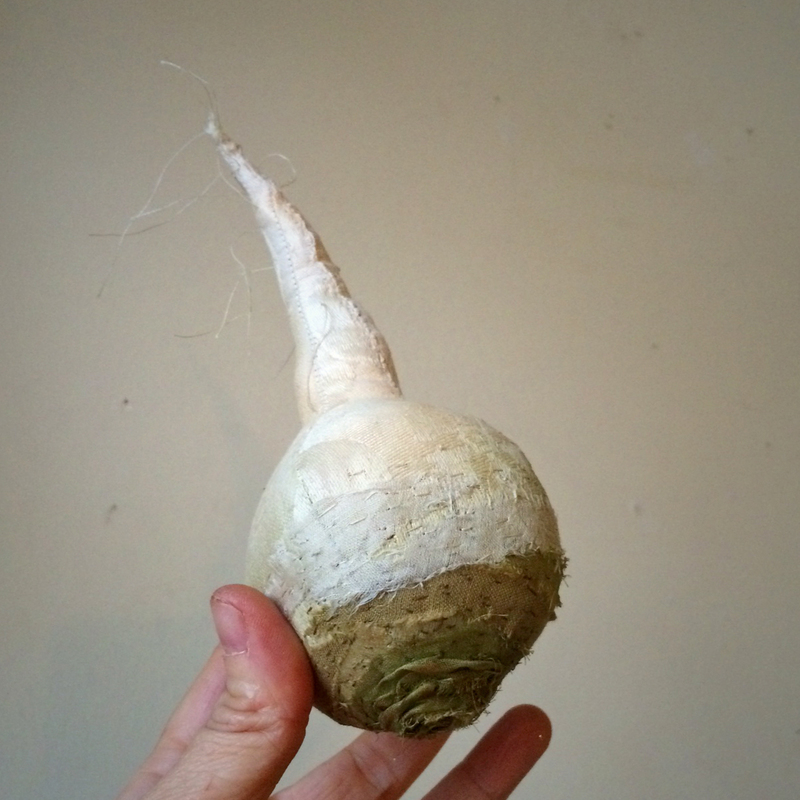 My subconscious must have been working on it for me and last night I woke up abruptly knowing exactly what it needed – a bulb, a more substantial stem and very simple leaves. I love the bulb! 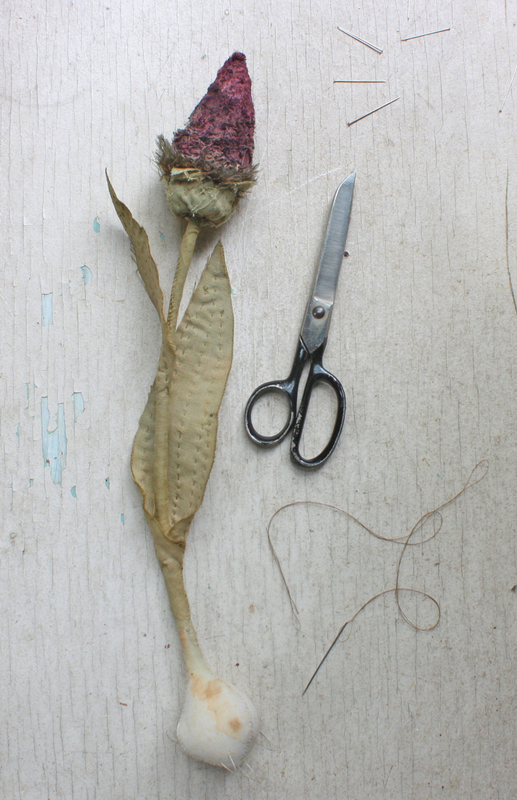 More botanical experiments soon – there are all sorts of strange new species on my work table. Mosquitos! 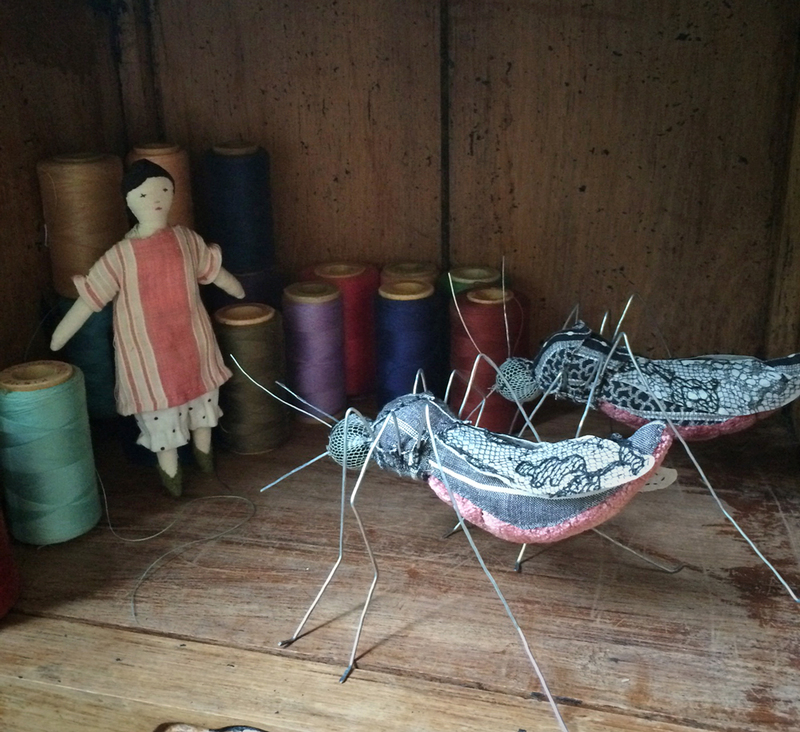 Delicate mosquitos, hand stitched from Edwardian garments. 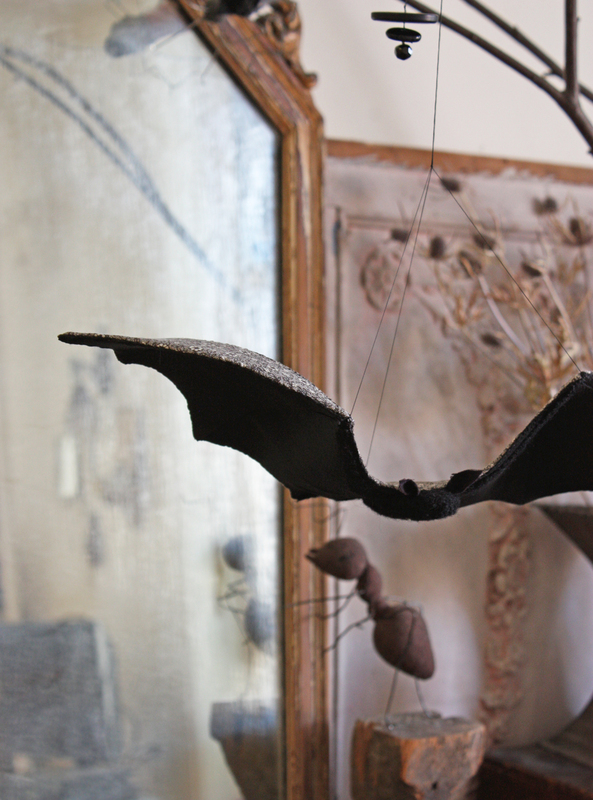 I wonder what she would think, the 19th century girl who floated across lawns in the gown their wings are made from. They are mischievous ladies who will bite! But they will be so gentle you won’t feel a thing. 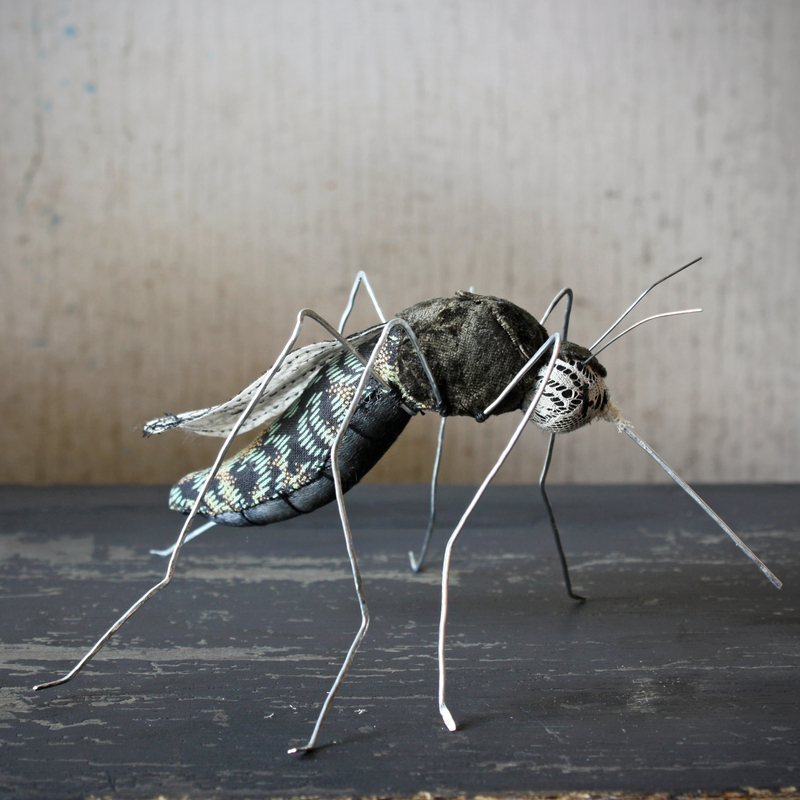 There is a special place in my heart for the less sympathetic creatures – the rats and bats and spiders and who is less loved than mosquitos? I made 6 – I had a truly marvelous time – completely lost in them for days. They are all in the shop (there are some songbirds too).